Running in Alexandria,Virginia? Check out the Mount Vernon Trail miles 11-13 page. 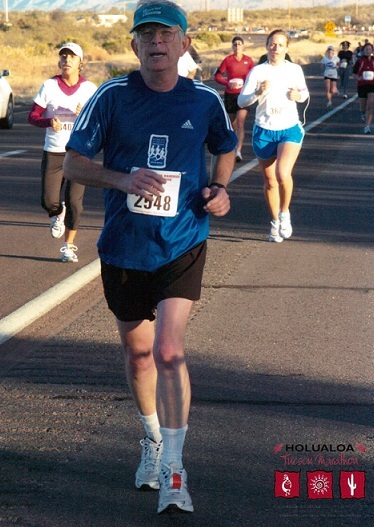 I am not the fastest runner!I had been a couch potato for nearly all of my life up until 1993. Then I took up running for about a year until both of my knees were experiencing so much pain I had to give it up. 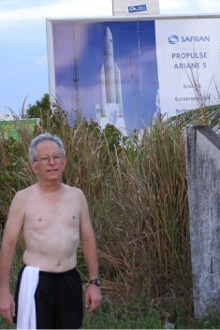 Time passed and in 2003 I was inspired by my wife Lynn Palmer to get into the NASA JSC physical fitness program in September of that year, and began to slowly start jogging. 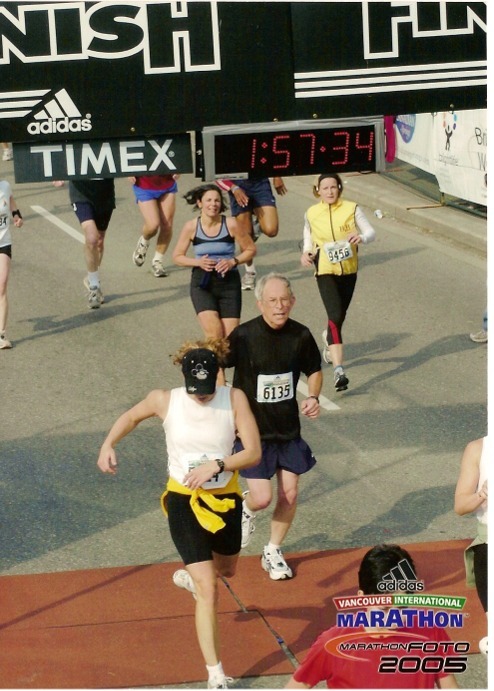 I ran my first 5k race in Toronto in August 2004 and after many fits, starts and injuries finally ran my first 1/2 marathon on May 1, 2005 in Vancouver BC. 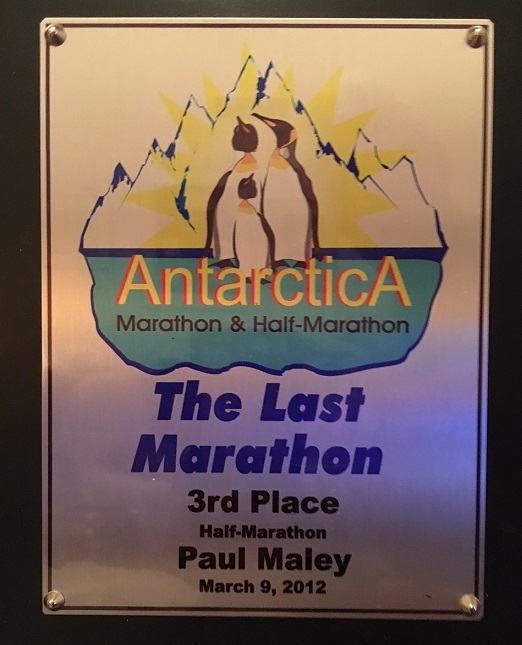 I have completed half marathons on all 7 continents. 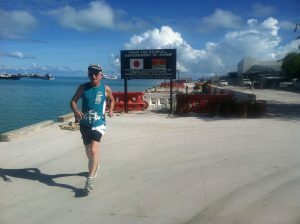 The following are some photos from race venues and locations where I have run. I spent one night in Tokyo Japan but the weather outside was quite cold. The hotel had 13 floors and the length of each floor was extremely long. I was on the 12th floor which was not fully occupied. 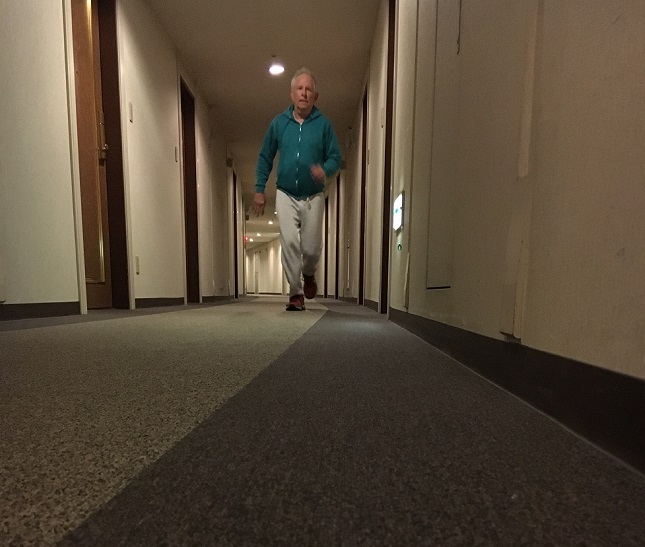 The floor was covered with thick carpet and at 2am I completed my run inside the hotel avoiding the freezing temperatures! 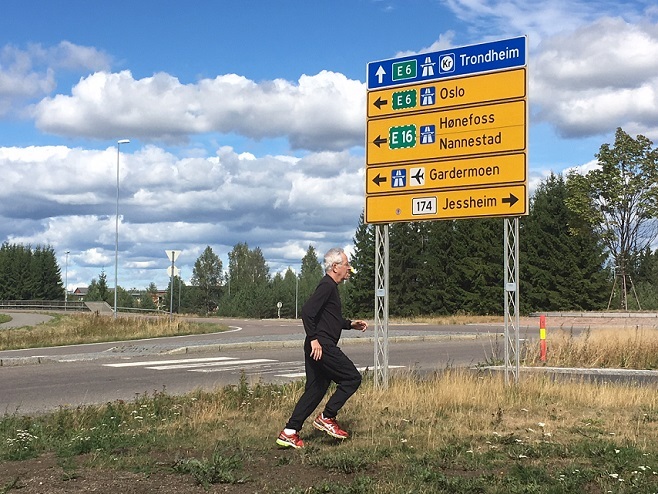 Very close to the Oslo airport there was a nice trail but also good asphalt surfaces on which to run. Temperature was about 60 deg F and very comfortable. 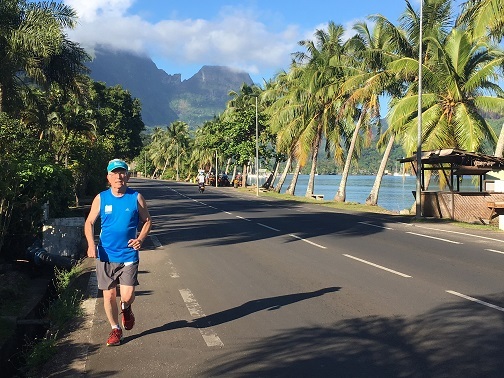 I have run in French Polynesia several different times over the years. and most of the roads have no shoulders, are two lane, and are dangerous for any kind of runs. 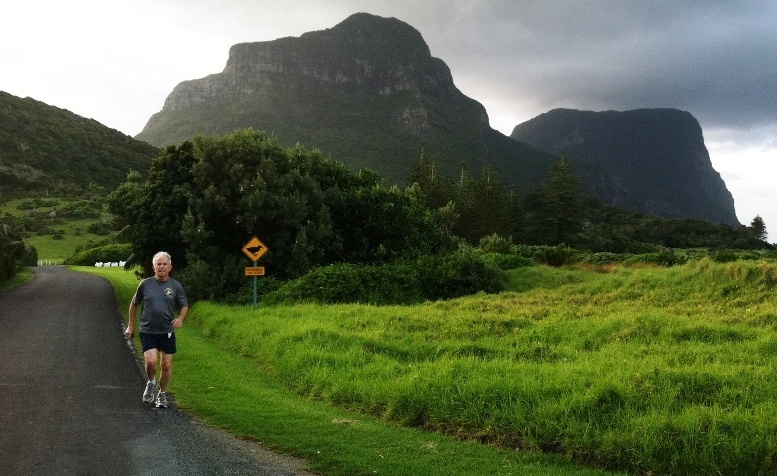 The road above in Moorea had a recently installed bike lane but this was the exception. Even so, traffic moves at high speed and any runner must assume that he/she can be run over by any type of vehicle. Therefore I have attempted to use any side roads, open fields or even parking lots to complete a run where the risk of runner/vehicle collision is high. 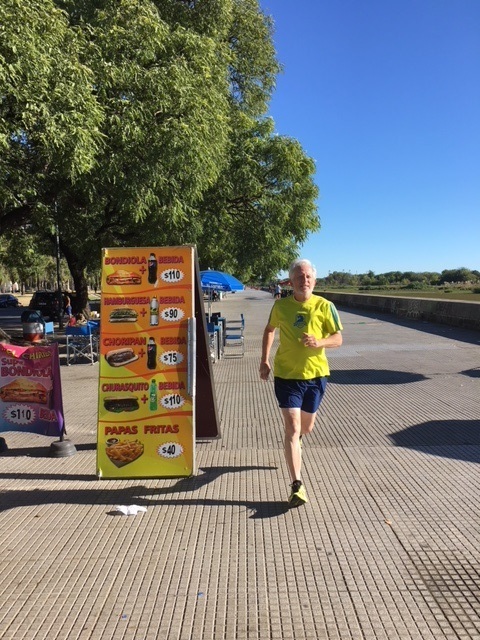 Running along Parque Mujeres Argentinas near the Hotel Alvear is not the safest experience as the tiled sidewalks have unexpected uplifts. The sidewalk is along the banks of the Laguna de los Coipos which is infested with water hyacinth but the path is wide and in early morning on a weekday is relatively uncrowded. I did fall here and was lightly injured as a result of the uplifts. 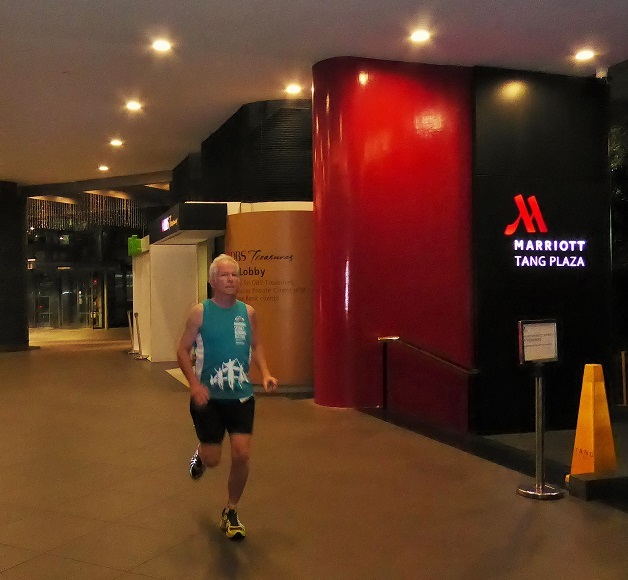 Running in Parque Arauco located behind the Santiago Marriott Hotel is a good venue in which to run. There are several different types of surfaces and you can run there unimpeded especially during the week and early in the morning. 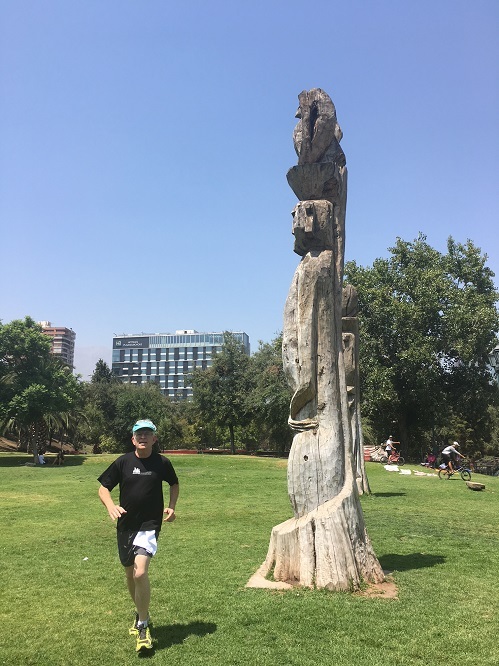 The non concrete surfaces are uneven so you have to exercise care as well as compete with other runners, bikers, walkers, dogs for space but there is so much of it in this urban park that it is a pleasure to run here. Singapore is generally a hot and humid place to run and having been there numerous times in the past I knew better than to run after the Sun came up. So it is not surprising that I chose to run at 430am when the temperature was 79 deg F when it was possible to run without encountering masses of people in the central business district, although I did spot one rat scurrying in front of a nearby 7-11 store. 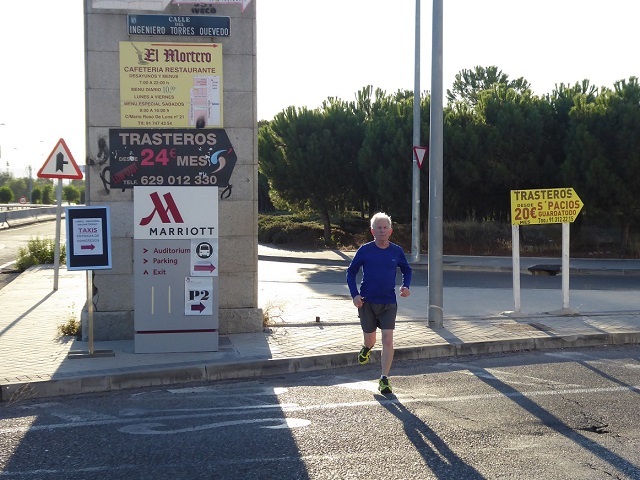 Running next to the Madrid Auditorium Circle Marriott Hotel with temperatures in the low 50’s made for a challenging activity on a Monday morning with lots of traffic on the side streets in the industrial area where heavy trucks are parked. 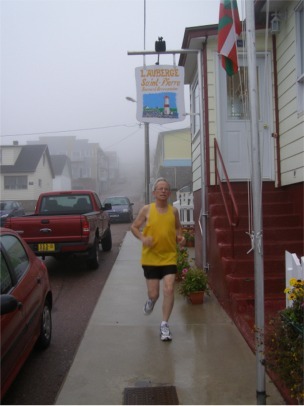 A cool morning for a run down the main street and through this small town. Temperature in the 50s which is perfect even though the Sun was up and people were starting to go to work. There were no safety concerns here and even though the sidewalks farther down the road are not wide, it was perfectly easy to make this training run. 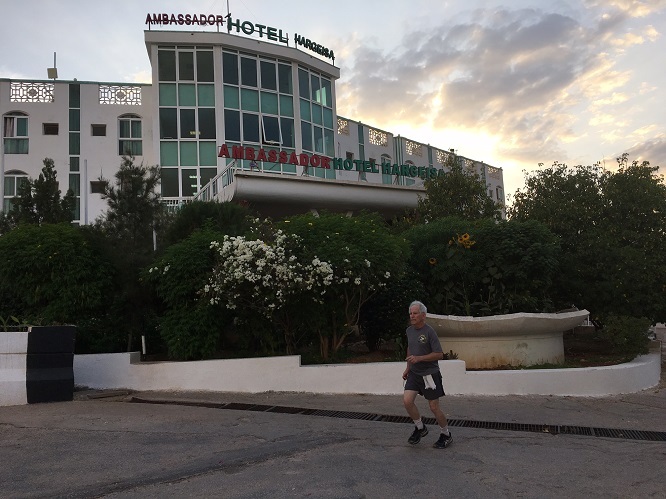 One of the more restricted running environment due to security concerns, I was able to run within the grounds of our hotel in Hargeisa close to the airport. Even though it was near the end of the day, it was quite hot and the ground uneven in many places. 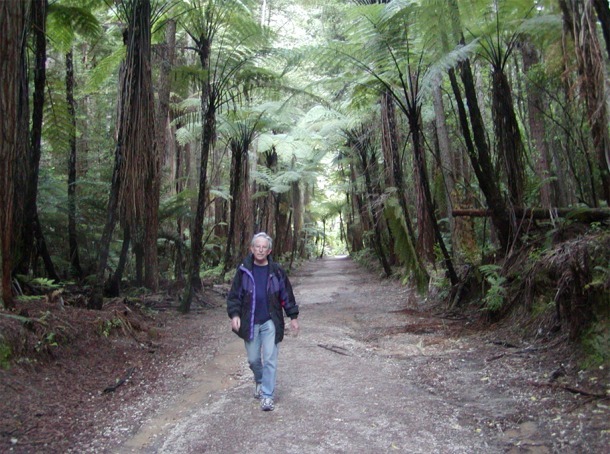 I spent 4 days on this remote island about 3 hours flying time northeast of New Zealand. 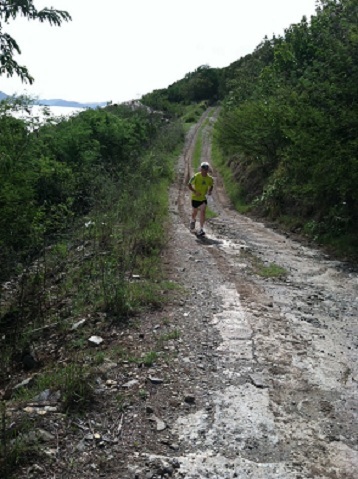 Running was complicated by having to dodge cars on a one lane road while partially running uphill, then downhill. In addition I had to be careful to avoid local dogs and crabs crossing the road. Hot and steamy as usual in Aruba as the high and low temperatures are generally the same all year. 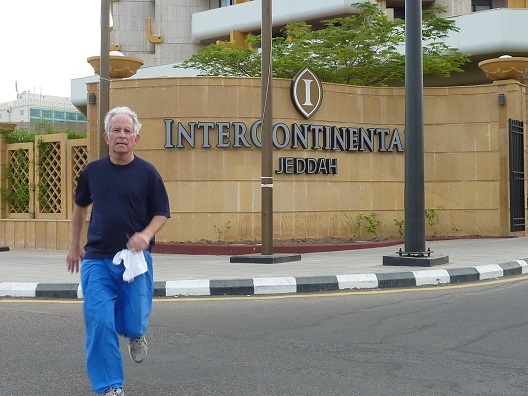 I ran mainly around the Renaissance Suites hotel although the main road in town along the water had good sidewalks for relatively safe running. This was along a busy road where the temperature was about 100 deg F, feeling like 104F. 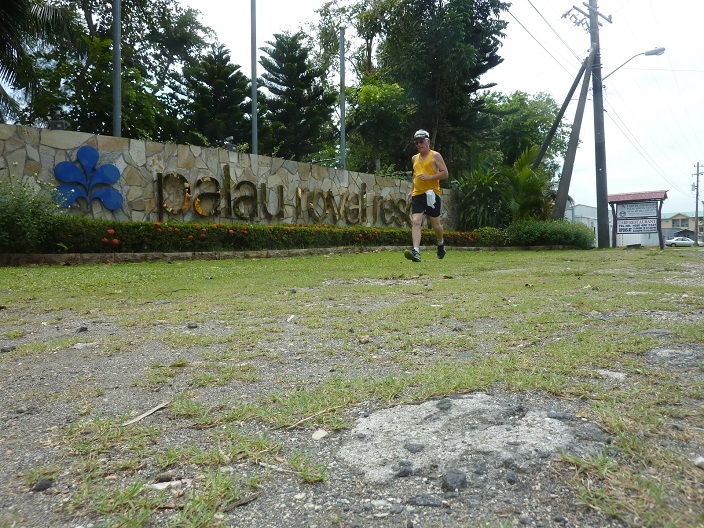 There are no sidewalks in the area of the Palau Royal Resort so it was all street running past the pier and then back over bridges. 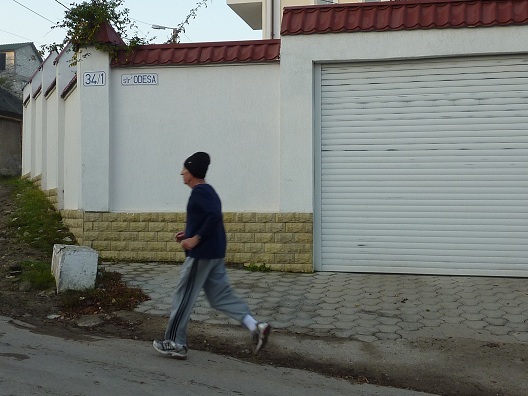 In Colonia again, there are no sidewalks so street running was the norm with slight uphills. 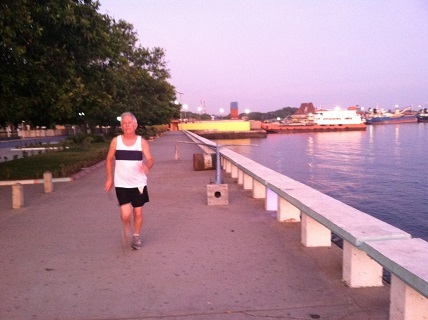 Again, the temperatures were quite high at the time but the run was scenic along harbor roadways. 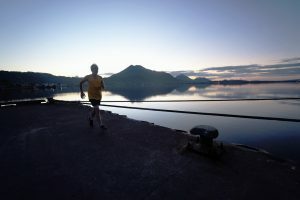 This run was in the port of Rabaul with the smoking Tavurvur volcano in the background just before sunrise. That volcano is located 3rd from the right in the above image. We were on a cruise from Honiara to Palau during this period. 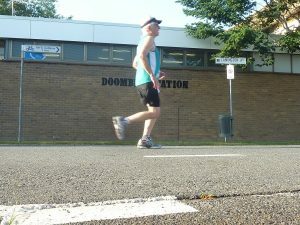 This run was along suburban streets near the Best Western 85 Airport Motel. Hardly any vehicles on the roadways and nicely designed sidewalks that stretched for miles including bikeways on both sides of the asphalt. In the early morning just after the rain it was easy running. Another high humidity, high temperature run along the port in south Tarawa, dodging motorbikes and cars. Even with SPF30 sunscreen I got sunburned. 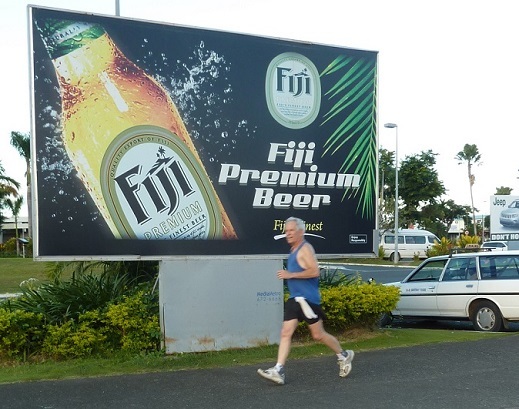 This was a truly difficult 4-mile run along the airport runway. No air traffic, just a few people crossing the road and some stray dogs. However, the humidity and heat was really oppressive. A predawn training run at 5500 ft above sea level on hill terrain. This is now a hotel but was built in 1932 by the then King of Siam. 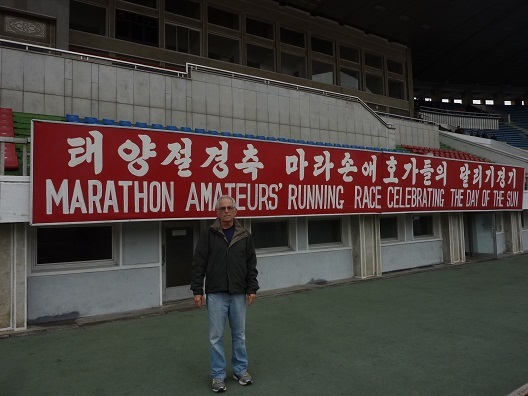 A stadium is located just down the road which has a good running track. Trying to run at 7200 feet above sea level up and down hills is very challenging. With no shoulders or sidewalks you take your life in your hands. The only safe way is to run in the direction of oncoming traffic and be prepared to jump out of the way somehow. 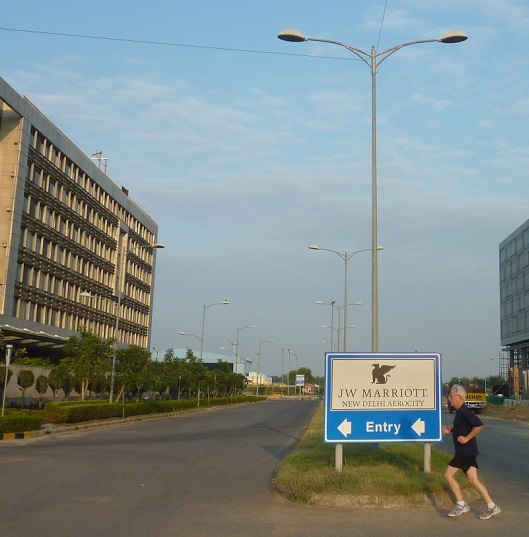 A late afternoon run by the Delhi airport on a day with little air pollution and light wind. This is the exception to Beijing and to Delhi proper but the weather conditions allowed it. No sidewalks, but there were pot holes, lots of local dogs but wide enough streets to get out of the way of any oncoming vehicles. 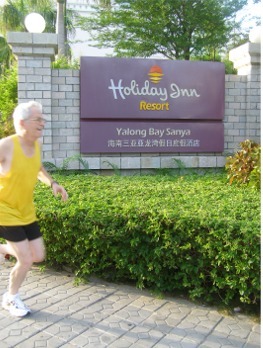 This was an early morning run at our hotel on a Sunday. That was the only time it was safe to run across the street due to the high volume of traffic. 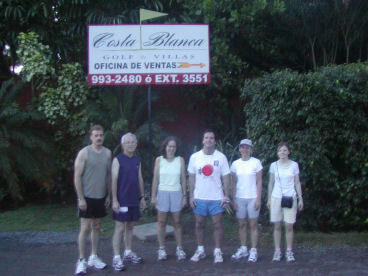 Since you see few runners and none in shorts, I had to wear long pants to try to fit into the culture as best I could. 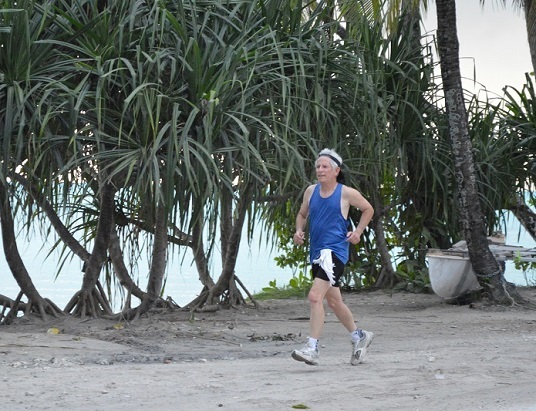 The running venue was along the newly renovated 1 mile long section of the corniche. Temperature was around 82 deg F but very low humidity. 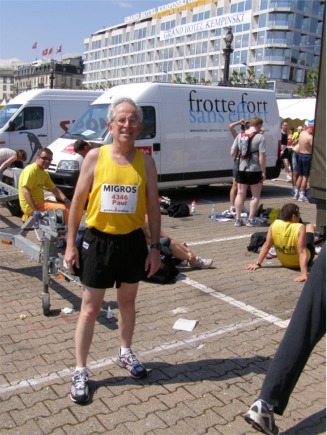 Nevertheless it was a challenge to run any significant distance. I completed the 10k in 54 minutes but the time keeping was a bit spotty as each runner was timed using a stopwatch by the officials. Most of the people running did not have accurate times recorded but I did note my own time. The temperature was nearly 50 deg F when the race started, and there were about 700 people running the half, full marathon and 10k. 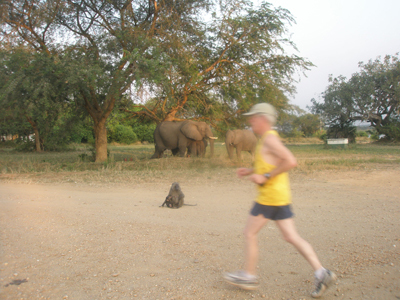 There were many local spectators along the 10k route which full marathoners had to repeat 4 times. They appeared generally happy and supportive and clapped as runners went by. 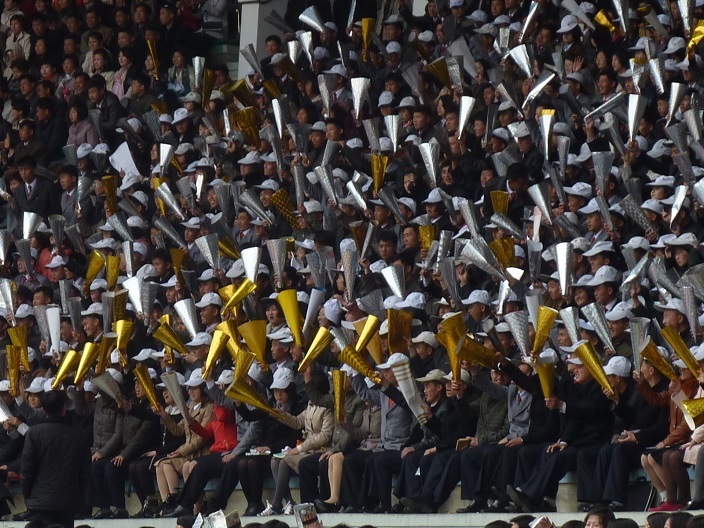 All the races finished in the stadium where crowds of enthusiastic watchers were prepared to cheer the runners on with the kind of enthusiasm seen at football matches. Nearly every seat in the 50,000 capacity venue was filled. 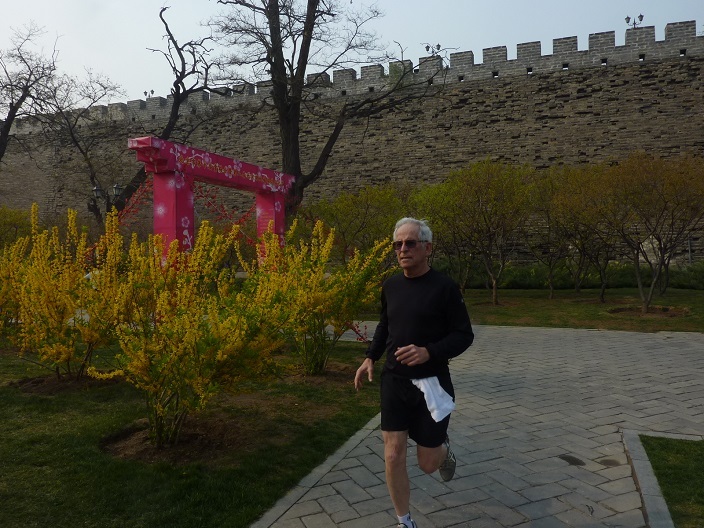 Running in Beijing next to the old city wall was easier than I thought this time. 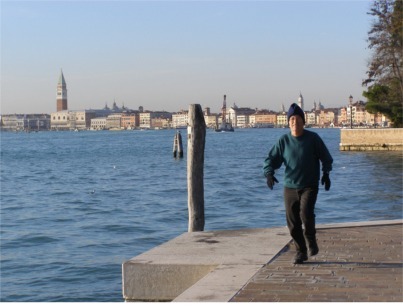 The city in April is still relatively polluted but a brisk wind kept much of it from being sensed on the ground and I was able to run around the area along the city wall near the Marriott Hotel. 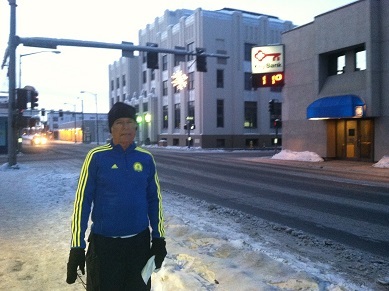 Running in Fairbanks during January is no picnic. The air temperature was +11 F and running on the sidewalks and streets was a bit dangerous due to many uneven and slick surfaces. However, there was no wind and overall the trails along the Chena River in front of the Springhill Suites Hotel were well packed. There was only 5.5 hours of daylight so it was necessary to take advantage of the long period of twilight when I could keep my eye on the surface in front of me and any motorized vehicles. This island has a number of moderately hilly roads. with relatively few flat roadways extending more than a few tenths of a mile. We had to contend with daily heavy downpours and running during the brief times the rain stopped. This idyllic island is a 1h 40 minute flight from Sydney, Australia and was first settled around 1788. Being 10 km long and between 0.3 and 2 km wide it has some flat stretches of road but otherwise is hilly. 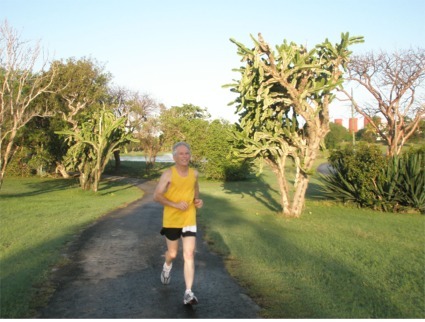 I conducted a 13 km run early in the morning mainly near the airport. It is one of a few places where I felt I had the whole island to myself before 7am. All roads are two lane with no shoulders but because there are relatively few cars, it is generally a safe place to run. Road running is totally unsafe in Sorong due to lack of shoulders and sidewalks as well as having to dodge motor bikes and cars. 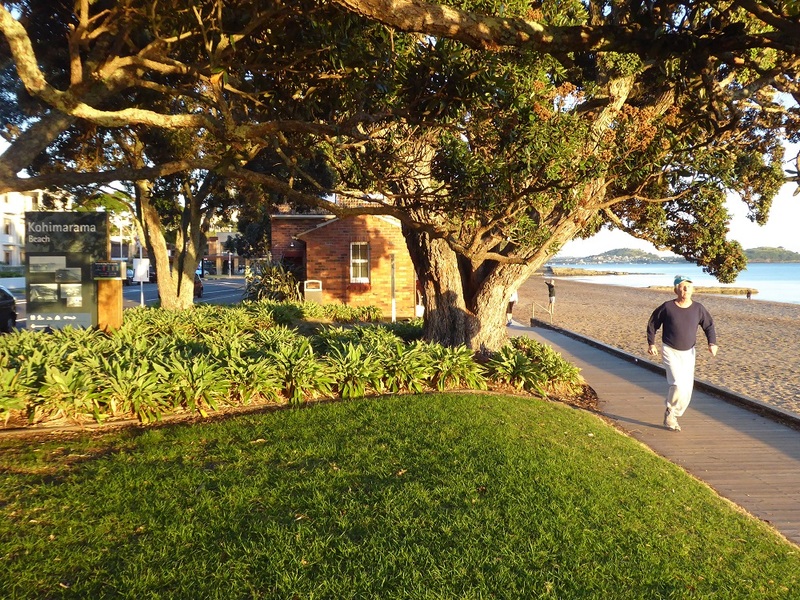 Thus running inside the grounds of the Luxio Hotel was the safest way to complete a training run. 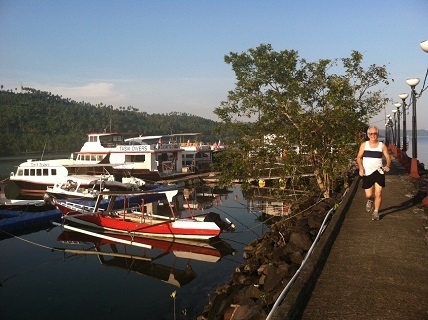 Running along the jetty at the Tasik Ria resort about 2 hours from Manado airport and about a one hour drive from the Lokon volcano. Before sunrise I ran the sea road about 2 blocks from Katua’s Hotel. Hot and sticky. After a 4 hour drive we got to this ocean site late in the day. 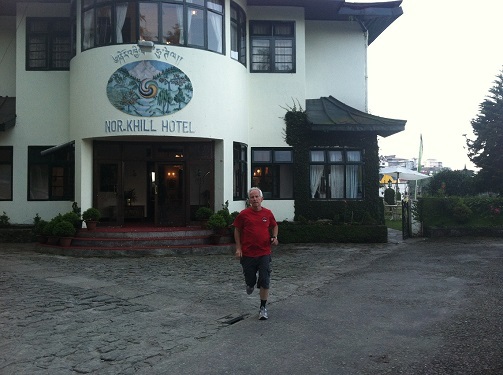 I was able to run 4 miles on the road leading into the hotel and the hotel grounds over uneven ground. Keeping a distance from local dogs was the only problem. 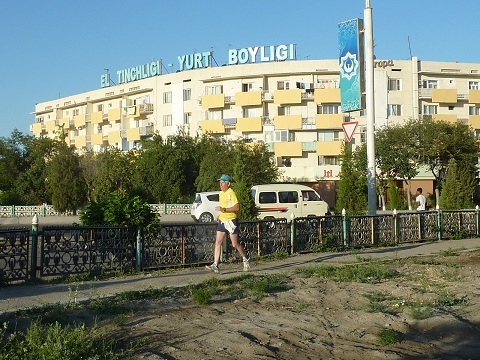 It was brutally hot during this morning run along the shore road near the Yalicapkini Boutique Hotel. With virtually no shade, I had to dodge cars and cats. 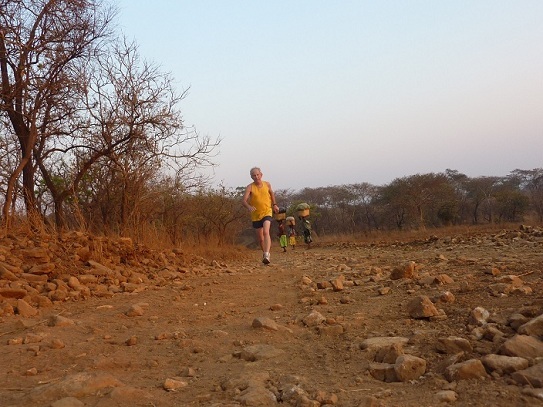 This run featured a 27 hectare hotel called Abloom Lodge, situated about 1h 20 minute drive from the Johannesburg airport. 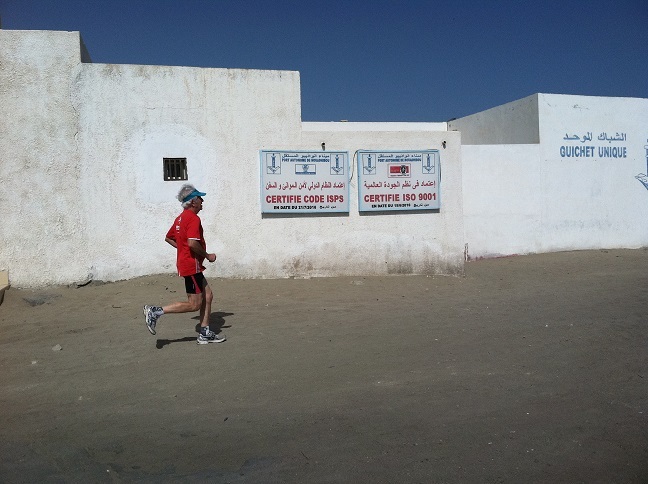 It was winter and running was made more difficult by the 1400m elevation and the soft sand dirt roads. 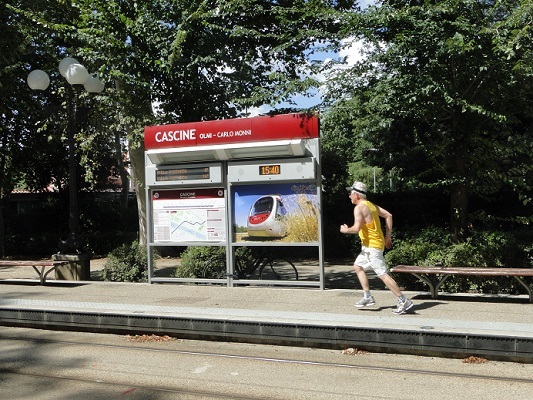 During a 6 night trip to Florence we found a fantastic running venue called Cascine Park. 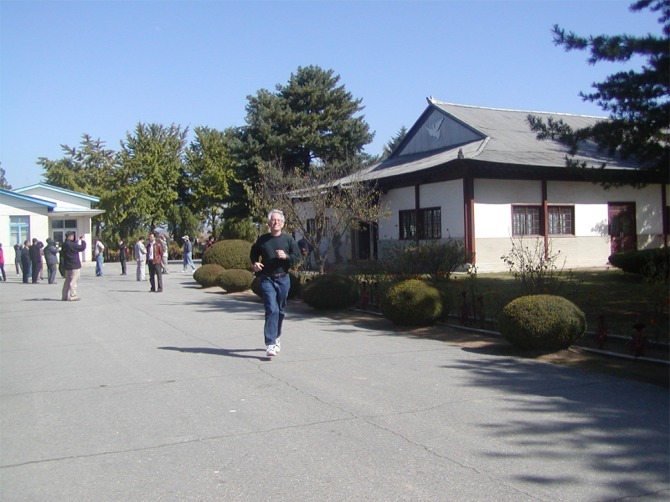 Constructed in 1563 this park is about 2 miles in length with a number of parallel running trails. The trails have a variety of separated surfaces including asphalt, concrete, packed sand, and crushed rock, perfect for walking, bike riding and jogging. 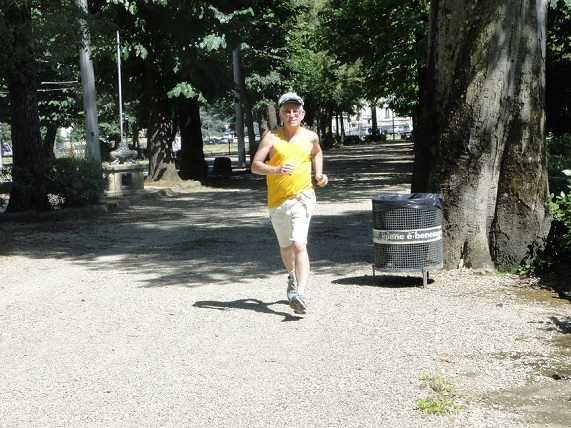 The park is adjacent to the Arno River and most of the running trails have plenty of shade. A train line also runs through the park. 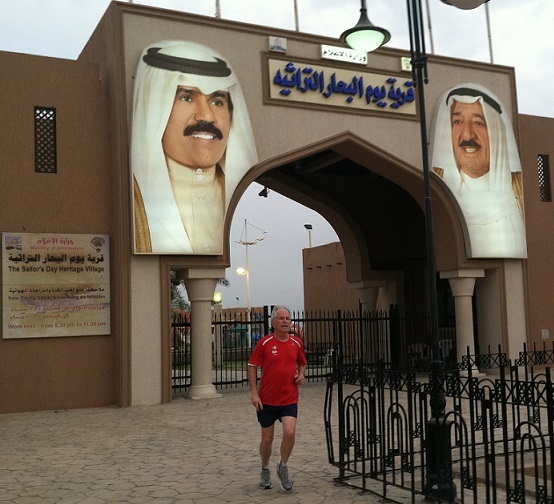 Running in Kuwait can be a challenge. 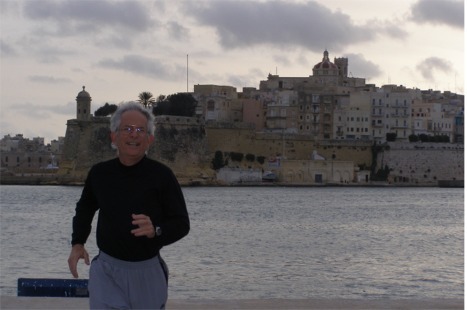 During May temperatures ranged from 85 to 109 deg F. I ran along the beach front just before sunrise in order to minimize the difficulty in running. Nobody else seemed to be running yet this was worth the effort in spite of dodging wreckless drivers. That same day a body of an Egyptian was found along the seafront near where we ran. 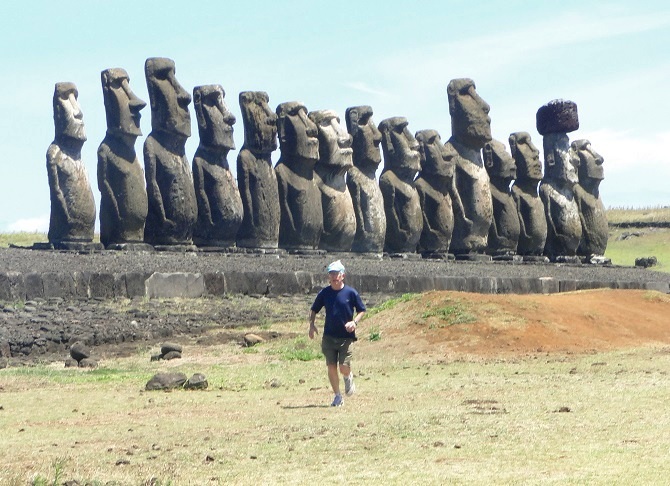 Tongariki contains the remains of the most intact Moai statues on Easter Island. The terrain makes it easy to run, especially when the temperatures cooperate as it did this day. Our ship, the Marina, traveled 416 miles from Valparaiso, Chile to reach this 10 mile wide island that was first discovered in 1574. In 1704, the sailor Alexander Selkirk was marooned as a castaway on the island, and he lived in solitude for four years and four months. Selkirk had been gravely concerned about the seaworthiness of his ship, the Cinque Ports, and declared his wish to be left on the island during a mid-voyage restocking stop. His captain, Thomas Stradling, a colleague on the voyage of privateer and explorer William Dampier was tired of his dissent and obliged. 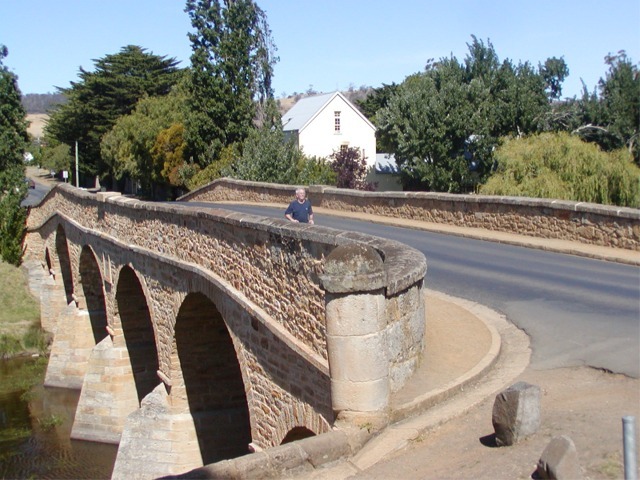 All Selkirk had left with him was a musket, gunpowder, carpenter’s tools, a knife, a Bible, and some clothing. The sailor’s experience most likely inspired Daniel Defoe to write the classic novel Robinson Crusoe in 1719. The area where we landed is mostly hilly and running quite challenging. This run was the last on a 13 day transatlantic cruise on the Sea Dream I. 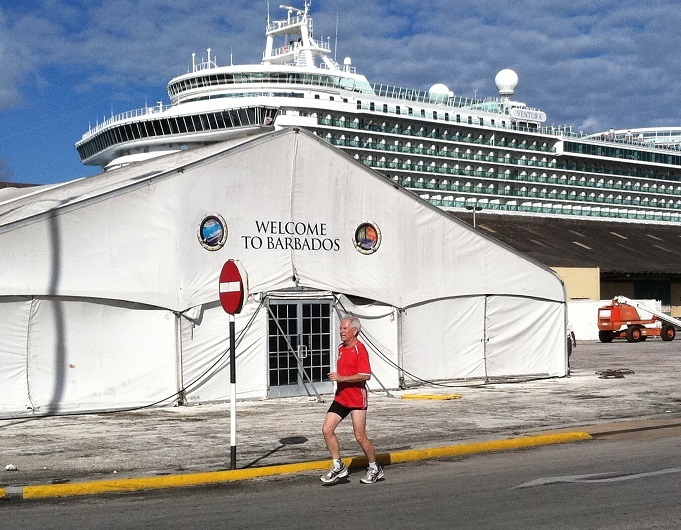 In Bridgetown we were only permitted to run in the port since the ship had no disembarked passengers. Because I had chartered the ship I was given first priority to disembark and was able to complete the 5 mile run. Another in port run on the volcanic island of Fogo. Temperature was around 80 degrees in the Sun and I attempted to use the shade of a large perimeter wall as much as possible. In order to leave the port we would have had to show passports. Even though I got mine stamped, it was more of a risk to deal with authorities to run outside the venue. 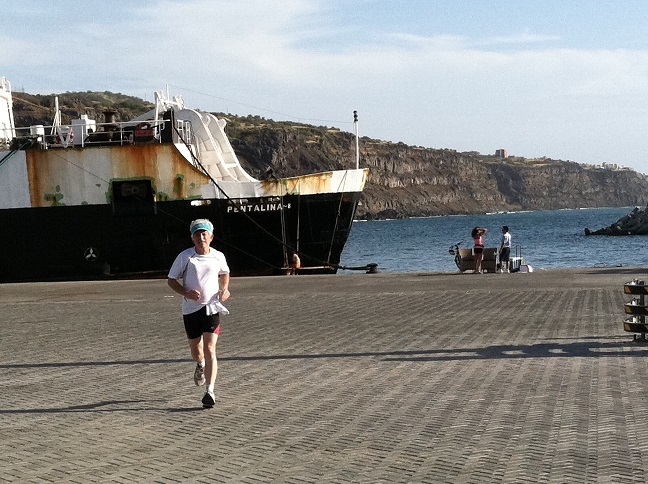 We had to dodge large trucks carrying cargo but in spite of that the docks were a good running stage. 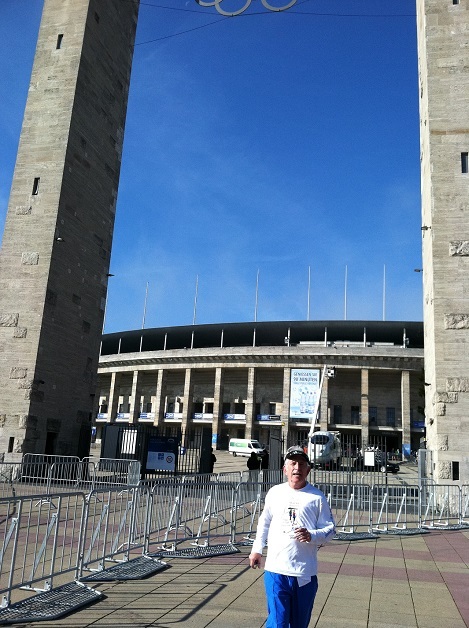 This photo was taken just outside the original olympic stadium of the Berlin Olympics of 1936. During those games, a new Olympic ritual was inaguarated, a lone runner arrived bearing a torch carried by relay from the site of the ancient Games in Olympia, Greece. This year I ran the 6km breakfast run with 10,000 other runners the day before the Berlin Marathon. Believe it or not, I actually came in ahead of all the other runners who symbolically jogged at a slow pace to the stadium from the Charlottenburg Castle. I was in Sochi, Russia on the way to South Ossetia through Abkhazia. However, the travel agency in Moscow who organized this collapsed in the two weeks prior to my travel. 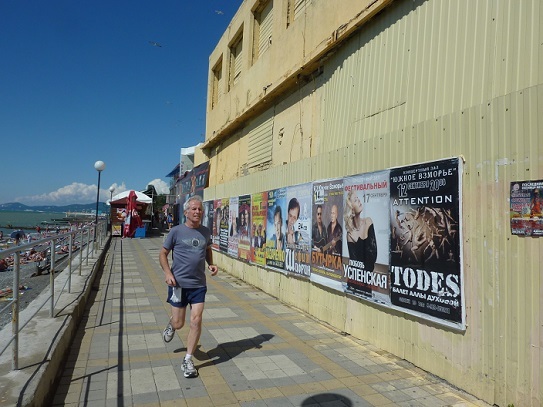 Instead I had to contend with running along the boardwalk in Sochi. We had a great small hotel on the Black Sea and since I had a limited command of the Russian language I was able to reorganize part of the trip in real time. Running here was nice in the early morning with temperatures in the mid 60’s and no rain. 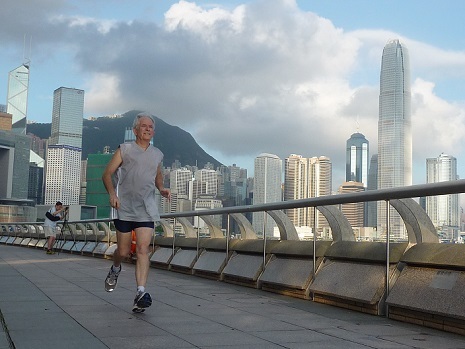 Running in Hong Kong is tough since low temperatures in August rarely dip below 80. In this case the run was done near the Hong Kong Exhibition Center after sunrise when the temperature was 84 deg F and it was sweltering. I was at the Harbourview Hotel which was just across the water on the Hong Kong Island side. 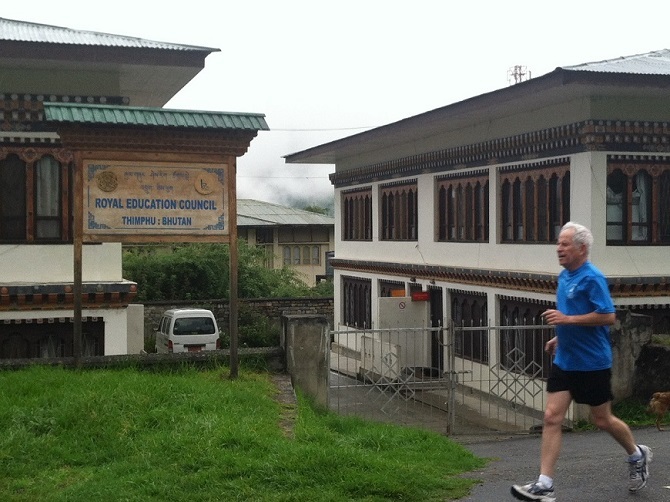 Because the traffic was a real problem, running was best accomplished by mostly running inside buildings. Corridors are designed to cover roadways leading from one building to the next such that one can run from building to building and never be exposed to rain; this includes running from the outside into airconditioned areas and back. 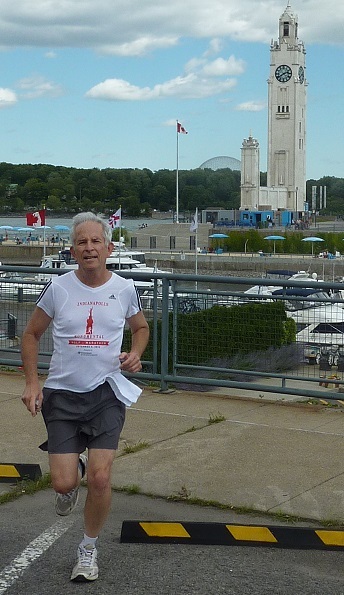 Spent a week in Montreal where there was good running action along the waterfront near the Le Westin Hotel. Even though it was early August the temperature in late afternoon was in the low 70s. 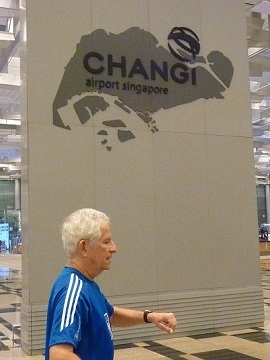 Running at the airport seemed the best thing with some sidewalks and less traveled side roads. 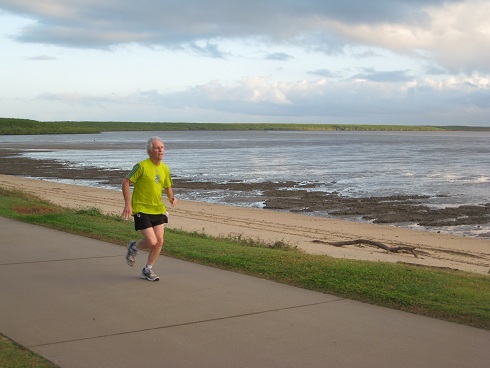 Recommend early morning or late afternoon runs when the wind is blowing and there are clouds blocking the Sun. No sidewalks anywhere, rapidly moving cars with lots of debris and holes in the roadway. Hot and humid. Be ware of packs of dogs. People very friendly. 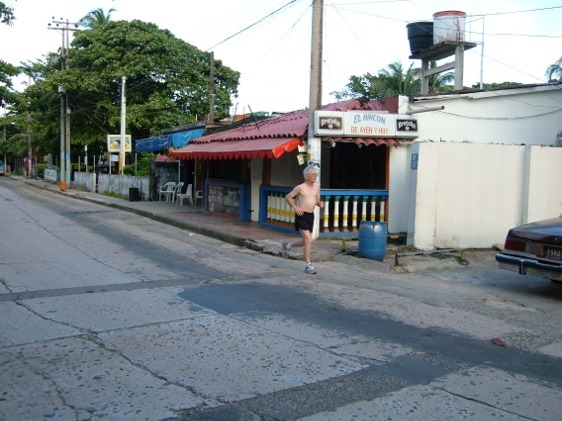 Tough running in the streets having to dodge potholes, traffic and pedestrians in a very humid and hot environment. Sideroads and parking lots of hotels seemed to be the safest places in town. 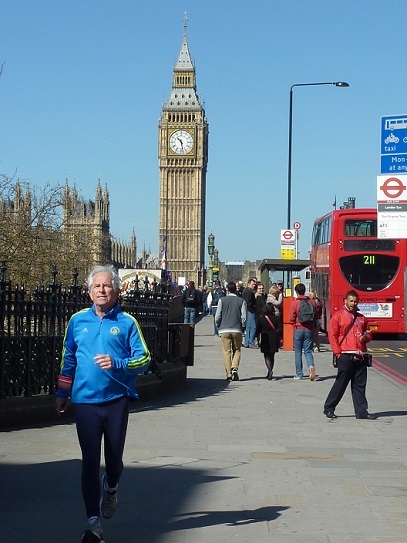 A rare clear morning in London, the day before the London Marathon. I ran 60 minutes around the Thames River with great temperatures around 45 deg. Perfect running weather! Most flights from the USA to Singapore arrive between 1130pm and 2am. Running is possible without interference after 230am or so in the long terminal corridors. It takes a 45 minute ferry ride, followed by a 1 hour taxi trip, then a 20 minute speed boat excursion before you reach the remote Nikoi Island resort. Located on 15 hectares it is an ideal vacation spot that is seldom visited by Americans. 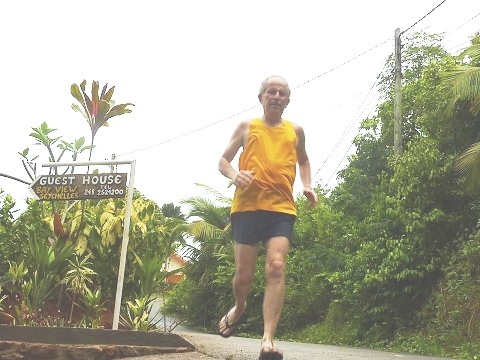 Conducting a training run can be a sweltering exprience in the high humidity conditions where temperatures range from 77 to 95 deg F in March, and you have to brave spiders and 3 to 4 foot long monitor lizards that might jump out at you any minute. 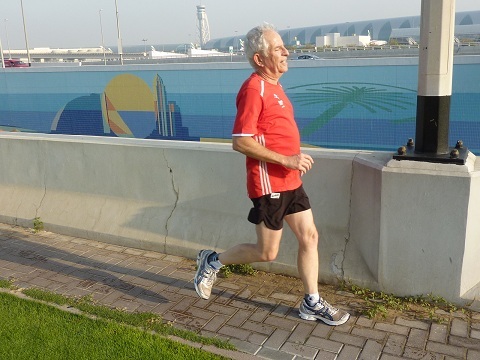 On a recent 3 day trip to the UAE I ran near the airport though it was very difficult due to the lack of safe trails or other runner-friendly places. I had intended to run to the emirate of Sharjah but it was all busy highway and very dangerous. The local running club has a very isolated spot south of the main business area and it was too hard to reach, so I opted to run along the airport highway. 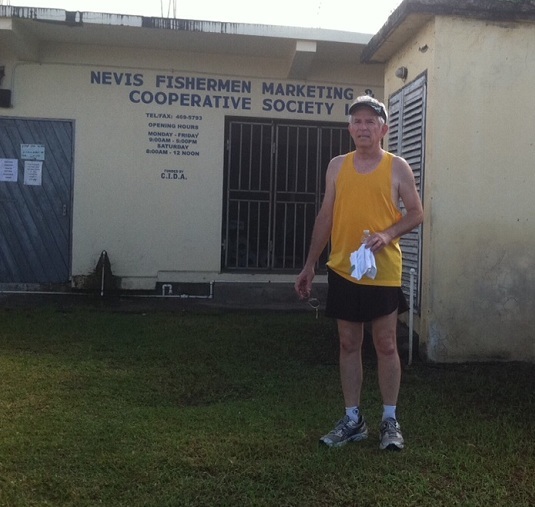 On Nevis the challenge was getting through town to a place where we could safely run. Streets were very narow with few sidewalks. Luckily we found a way to get to the cricket stadium where we were rained on yet still were able to complete our training run. The coastal road at Jost Van Dyke, BVI is an up and down winding road leading from a beach where the only way to land is via a Zodiac boat. The road is two lane and paved and offers no shade. Temperatures there typically ranged between 75 and 85 deg F with the only real danger was being run over by a fast moving local taxi. This is the island of Montserrat, site of a volcanic eruption in 1995 when the Soufriere Hills volcano destroyed the town of Plymouth. 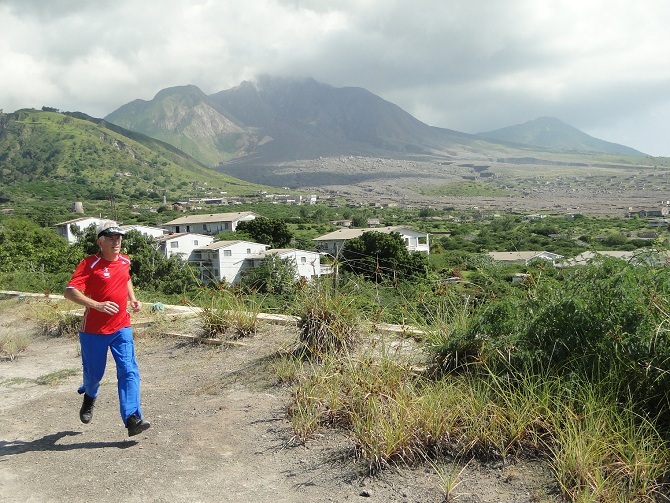 However, on this day I was able to run in one of the abandoned residential areas of the town with the still steaming volcano in the background. 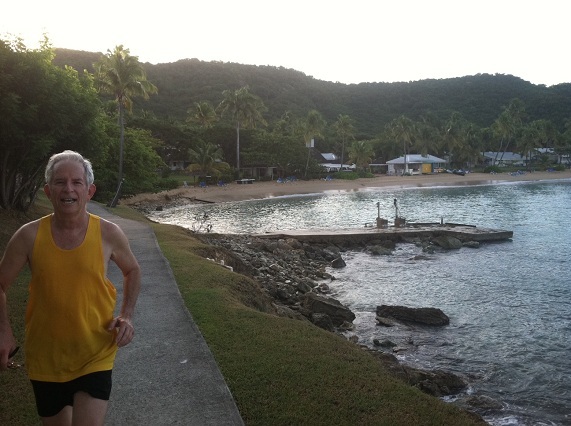 We stayed at Rex Resorts Hawksbill Bay where we could run next to the shoreline at this wonderful hotel. No worries here! 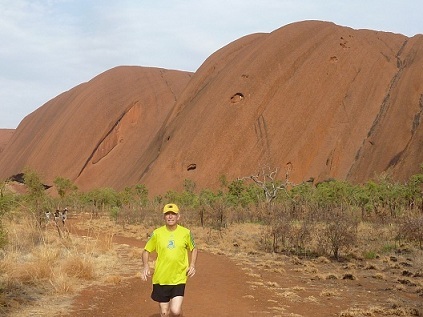 At Uluru (Ayers Rock) I was able to run and also walk the entire 12km around the rock itself. Trails were flat and supportive but full of tourists. 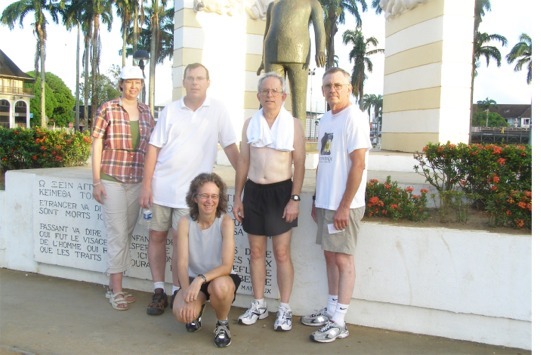 I was training for the 2012 Eclipse 5K run that we organized for a tour to Cairns to see the total solar eclipse on November 14. 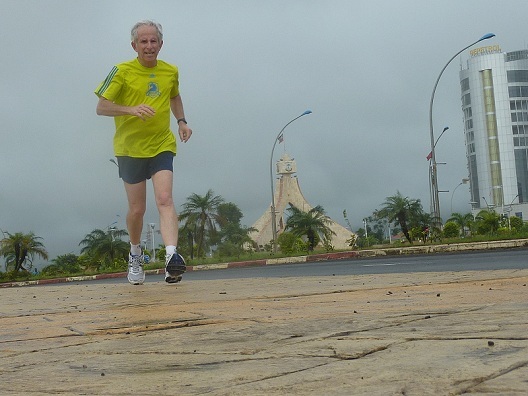 The run was along the esplanade in front of the Hotel Mercure where temperatures were in the low 70’s with sporadic rain. 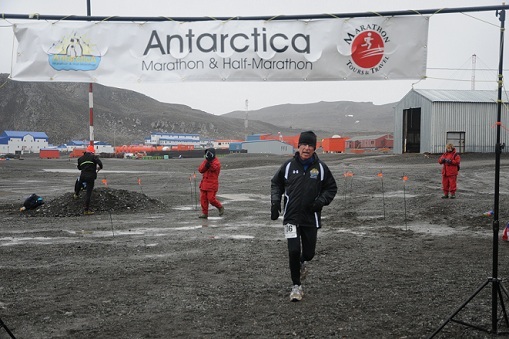 This was my first half marathon since being injured in Antarctica in March. I came in 8 out of 30 in my age group, pace of 9m 14s/mile, and finishing time of 2h 01m 11s, 2015 out of 4985 total runners. Not great, but I did finish without injury. 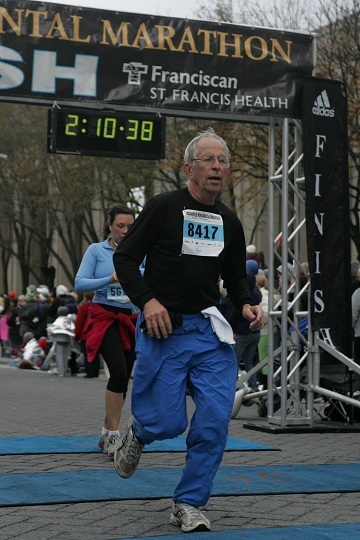 Temperature was 35 deg F and rain held off until after I finished. This was the second trip to Addis I have made in the past 3 years. At 7800 feet above sea level, the running temperatures were ideal (in the 50’s) but scattered rain storms made luck a critical element in keeping dry. 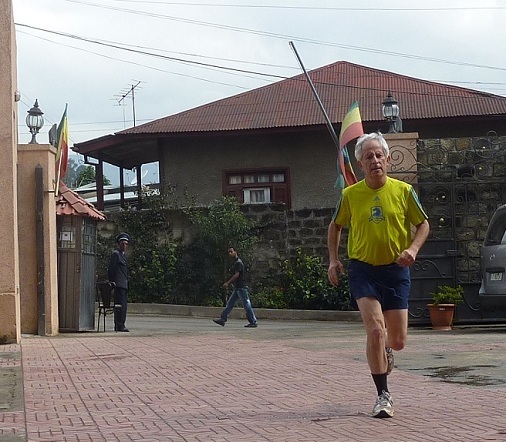 In the photo I am returning to the Hotel Addis Regency, locatd in a very unattractive part of the city about 30 minutes from Bole Airport. 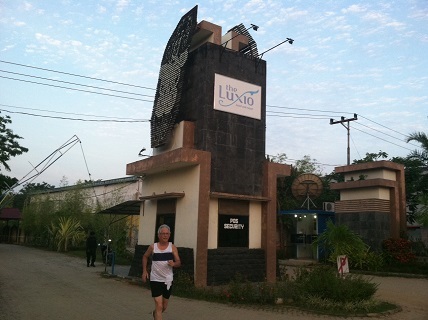 I completed a 7 mile run on the dairy farm/hotel known as Kumbali Lodge, just adjacent to the presidential State House. There are miles of hard packed dirt roads where I encountered local people on the way to work. Trails were easy with sweeping vistas, colorful birds and good temperatures. Near the Hotel Ibis I was able to run along sidewalks without any interference. 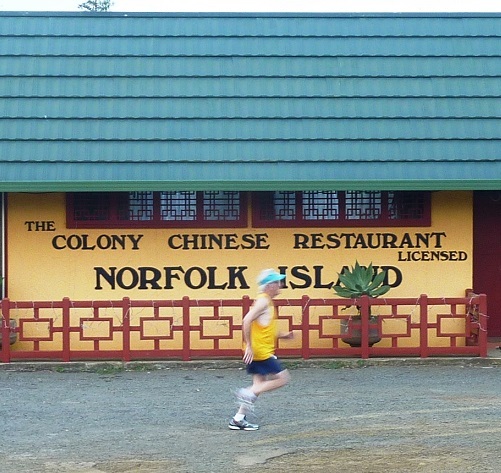 Modern buildings constructed by the Chinese are sprouting up all over the island and there did not appear to be any sign of any other runners. Here also I had dodge passing constant rain storms. Near the city of Victoria running along the shore road was difficult due to no safe shoulders or sidewalks and oncoming buses. However, I was able to make it safely through a 4 mile training run even though I got a good drenching from a passing storm. 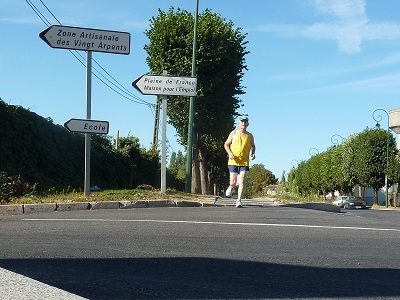 I was able to complete a training run while on a 14 hour layover at Charles de Gaulle Airport near the Comfort Hotel. 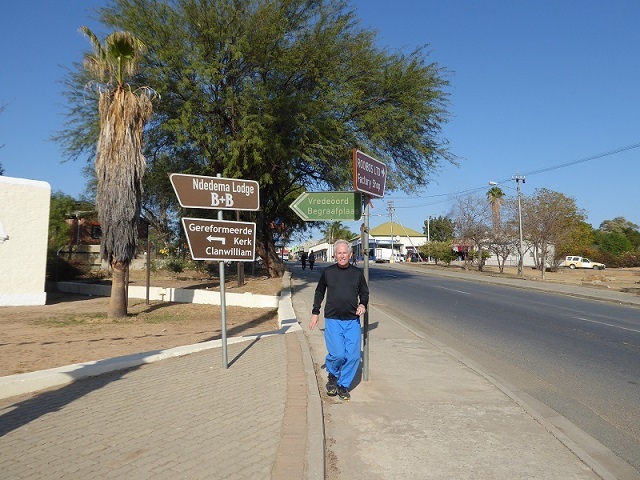 Running was easy along the few bricked sidewalks adjacent to the airport but the rest of the run was along dirt roads leading into farm fields since the hotel was located on the edge of a small village. 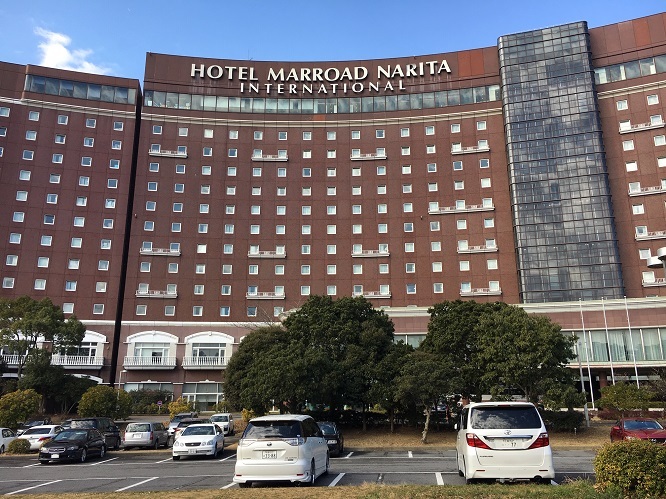 I stayed on Port Island, located between the Kobe Airport and the city of Kobe. Here the sidewalks were 3 meters wide with smooth transitions between street and sidewalk. No curbs or other pot holes/obstructions made this a nearly ideal running environment except for the heat and humidity which rivals Houston. Kobe knows how to design sidewalks for runners as are many other venues in Japan! 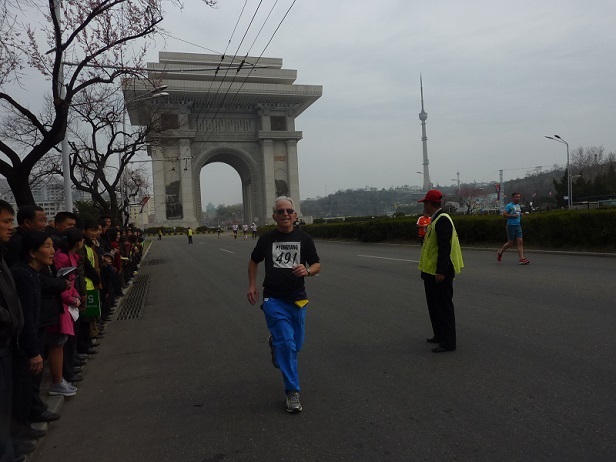 This is the morning I set up our Transit of Venus 5k fun run in central Tashkent( below). Although only 3 participated due to the early hour and long touring days, the air was dry, skies clear and pollution absent. 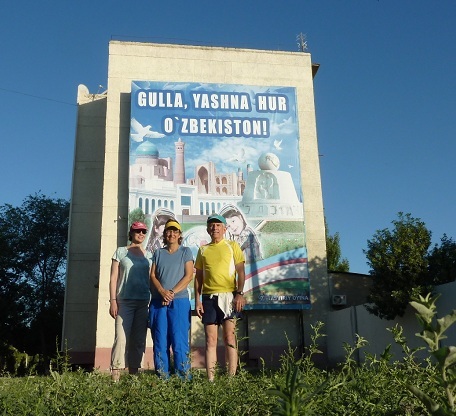 We ran along city streets that had very light traffic early in the morning (545 am) and continued afterwards touring Uzbekistan. When running here beware of pot holes, irregular surfaces and steps! 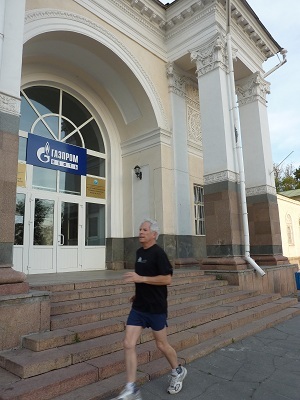 I was able to run in front of the old Frunze airport building adjacent to our Ak Keme hotel location in Bishkek on a clear, dry morning. Altitude was 800m (2600 ft) with a bit of an uphill. 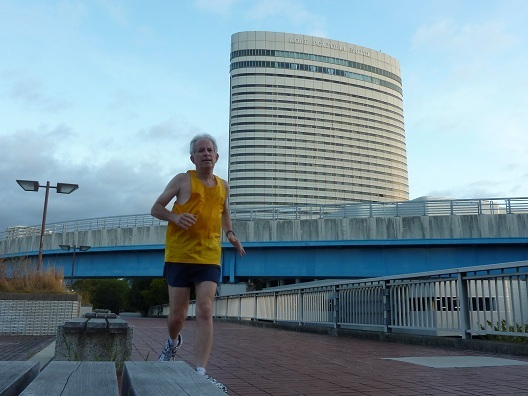 Running can be difficult in Japan especially around Tokyo’s Narita airport where there are lots of hills. 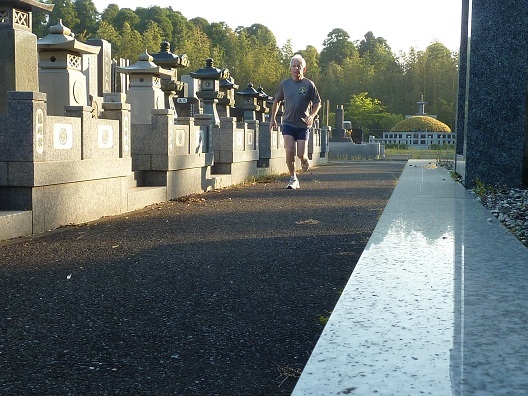 I found the best running area appeared to be around local cemeteries where nobody appeared to be around, especially in the early morning. Many of the road ways have no shoulders, but the most difficult problem I found was the air quality. 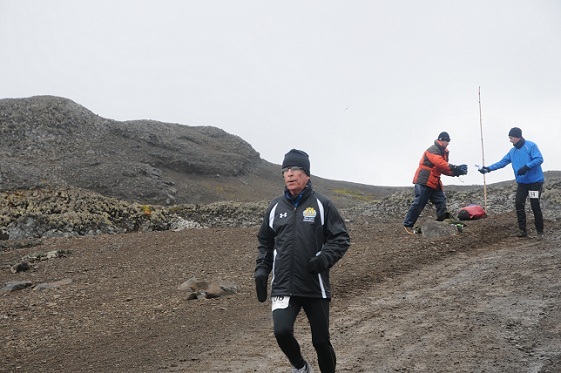 King George Island was the site of the 13th Antarctic marathon and half marathon. I ran the half in abysmal conditions. I train on flat ground but the course was very hilly. 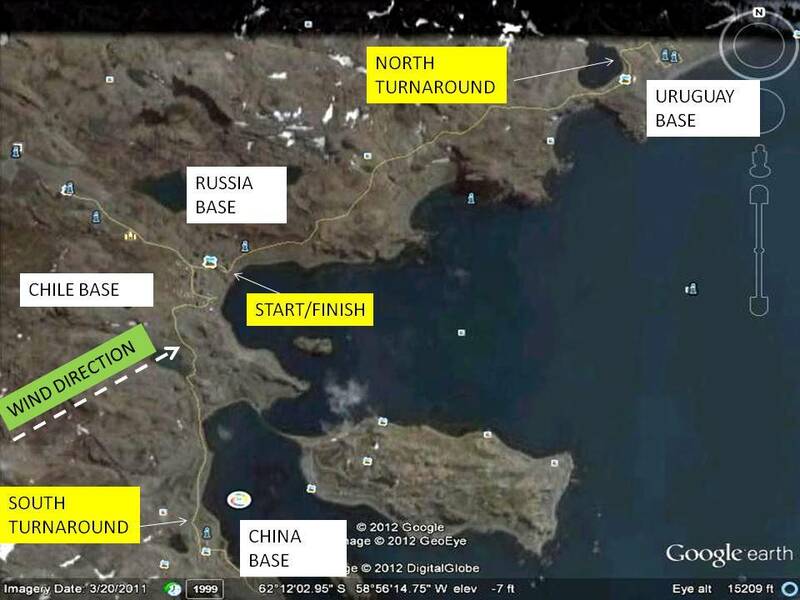 It began at the Russian base of Bellingshausen, moved north to the Uruguayan base at Artigas, then back to the Russian base, south to the Chilean base and then the southern turnaround point was the Great Wall Chinese base. The weather was frightful with ambient air temperature around 35 degrees F, and periods of rain, sleet, hail, and horizontally blowing snow. Mud was pervasive with even small lakes that we had to jump over. A constant wind was blowing from the southwest to northeast with gusts up to 45 miles per hour. This resulted in an actual temperature of around 19F. The last two miles of the course I could barely talk since the lower half of my face went numb. As I moved north the wind actually blew me uphill and on the downhill (when it was also to my back) the pressure on my feet as they came down on the steep surface was such that I experienced a first time back spasm that was so bad that I could not walk upright after the race. The tour operations medical officer applied pressure to my lower lumbar area which enabled me to eventually be pulled up and then with help made it to the Zodiac which took me back to our ship, the Russian science vessel “Akademik Ioffe”. Of the 25 official half marathon runners, I came in 3rd out of the male contingent in spite of this. My time was 2h 44m which is about 45m later than normal. I was amazed to have finished at all. Nevertheless, this was an incredible experience which will be hard to beat! The entire trip, crossing the Drake Passage from Argentina and back (normally storm ravaged) was basically calm. Our daily landings in various parts of the Antarctic Palmer peninsula were mostly clear with flat seas. Unbelievable!! Of all the trips I have taken to 252 countries so far, this ranks up there as either number 1 or 2. 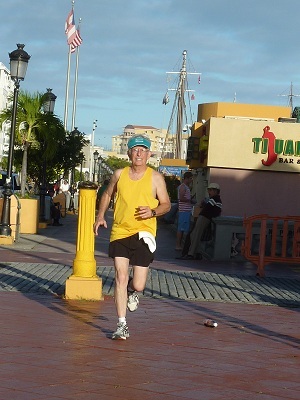 Running along pier 1 on Isla Verde, Puerto RicoJust before setting off on a 6 day Caribbean cruise from San Juan on the Sea Dream I, I did a 4 mile run along the port area. Not an easy area to run in due to traffic and general lack of suitable sidewalks. Nevertheless, even in the 80 degree temperatures it was not too uncomfortable. Ethiopia is an interesting part of east Africa with some of the most helpful and friendliest people around. 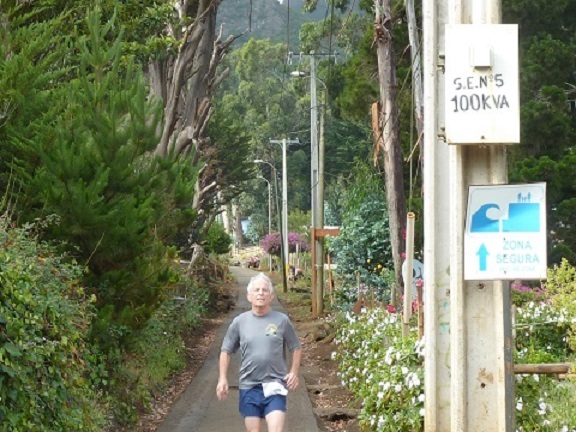 This run had 36,000 participants and even though it was just 10k the altitude of 8,000 feet (2500m) made it tough for those of us who train and run at sea level. The day was warm with no rain and the so-called early start of 3 minutes before the main crowd was not what was advertised. 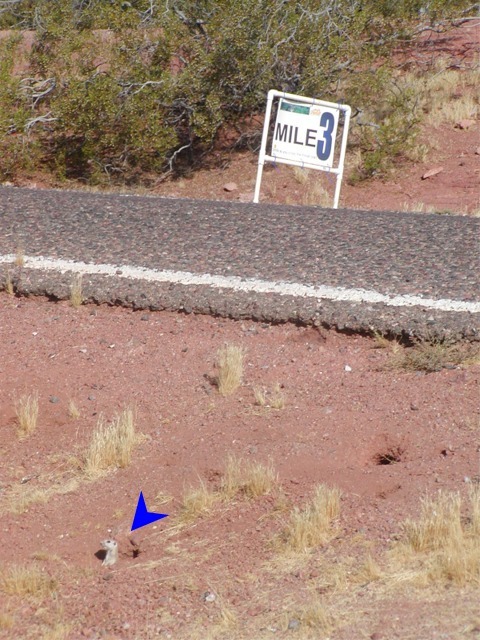 At the starting gun, there was no mat for our chip to activate and after just a few minutes we rounded a curve and into the main group of runners which had already started! Progress was slow because of the sheer number of runners, some holding hands making it hard to pass. 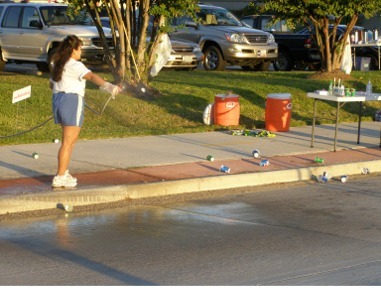 Water was available along the course for purchase from street vendors! Only one official race water stop at the 8k mark where one person tossed out small plastic bags of water. It took me 5 tries to catch one with a huge number of bandit runners vying for the same water. The roads were generally wide enough to accommodate the large herd of participants which looked like a migration. There was a sea of red shirts as far as you could tell–without a beginning and without apparent end. 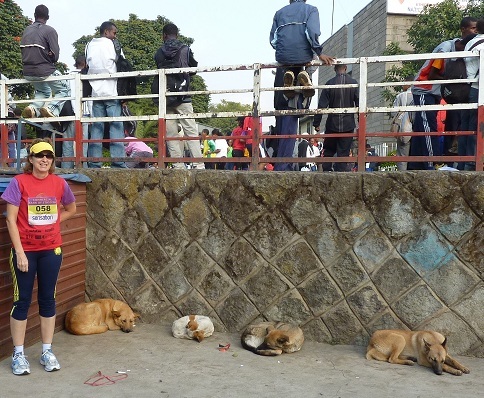 Lynn and the dogs that kept us up at night sleeping it off during the day before the race. At the finish line there was no mat to cross and different trucks handing out finisher medals with no regard to finish time; each medal color was supposed to relate to where you finished (first, second, third group of 12,000). Then runners were herded into the national stadium area where if you tried to leave you were seriously threatened by a line of police with batons who literally where beating back runners who tried to leave the stadium since the only way out was through the constant stream of new runners finishing. Along the streets there were small but enthusiastic groups of onlookers, but it was the local Ethiopian runners themselves who were the most interesting. They ran in teams or groups chanting and singing the entire route. Others walked. I managed to pass a lot of runners and with my rather modest finish time of 1h05m24s clock time, I had no idea where I placed due to the fact that only the elite runners were apparently guided across mats. While the logistics for independent foreigners were somewhat lacking, even though Lynn and I were separated by the vast crowd, neither of us had any trouble meeting back up through the help of locals. 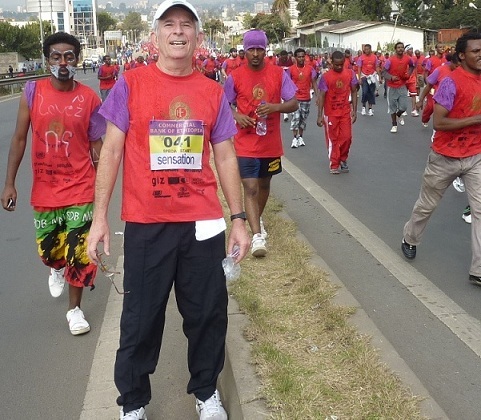 The title of this race was the Great Ethiopian Race and the reason for it was the friendliness of local Ethiopians! I cannot underscore how enjoyable this made everything. The above criticims would have had more weight in any other setting. One of the taxi drivers who drove us only during the preceding day even participated in the race and came up to us afterward to say hello. 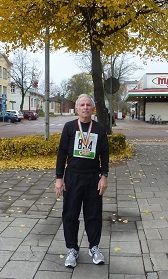 I came in 149 out of 228 half marathoners (5 out of 9 in my age group) mainly due to the very fast abilities of Scandanavian runners compared to my relatively slow speed–time of 2:01:42. The venue was fast and flat with only one minor hill with a shallow slope. Temperature was in the 40s with a 15mph wind and overcast so overall, conditions were perfect. Mariehamn is a nice, small island town situated between Sweden and Finland and once we arrived here, we had no problems at all. 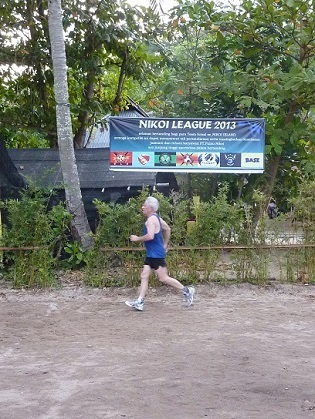 There were entrants from 11 nations and I was the only American in the half marathon section. Near the Tbilisi Marriott Hotel. 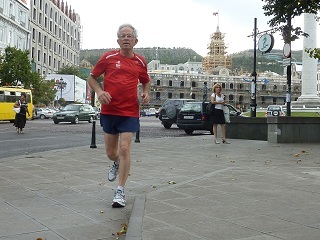 Running in downtown Tbilisi is not preferred because of the hills, traffic, uneven surfaces, construction, etc. Besides there are also the numerous crazy drivers that do not respect pedestrians. However, the Mtkavi River flows through the city and that is where I did my weekend long run of 70 minutes. The initial start of the run took me around Freedom Square and the underground passage where I drew a lot of strange looks. Nobody in the town wears shorts of any kind even in summer apparently. 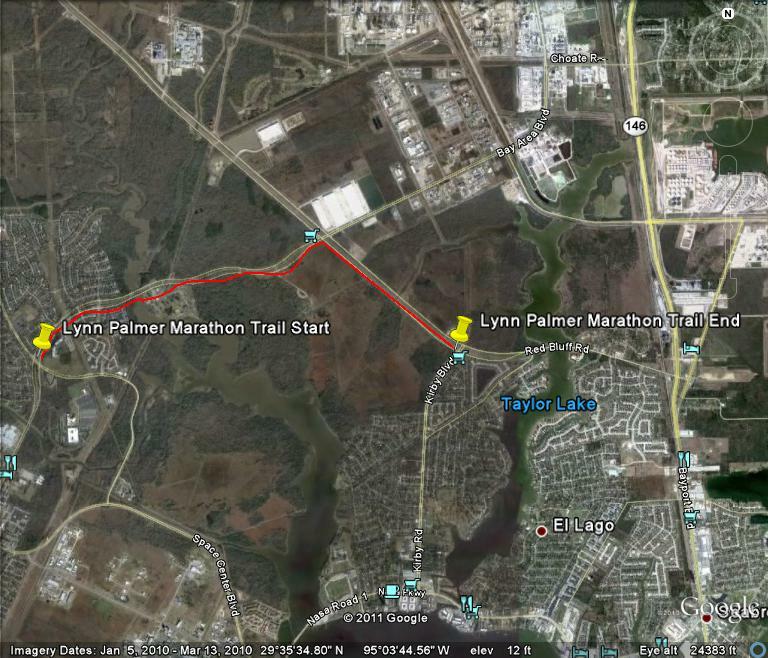 A map showing the 3.4 mile extent of the Lynn Palmer Marathon Trail established today in Houston, Texas. The two pins identify the places where trail signs have been installed. 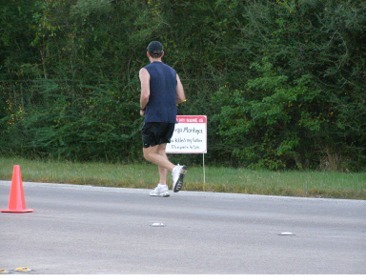 In August 2009 I submitted a proposal to Harris County Precint 2 to create a running trail in the local area. The trail had been already in existence for a few years but had the generic name of “bike trail”. 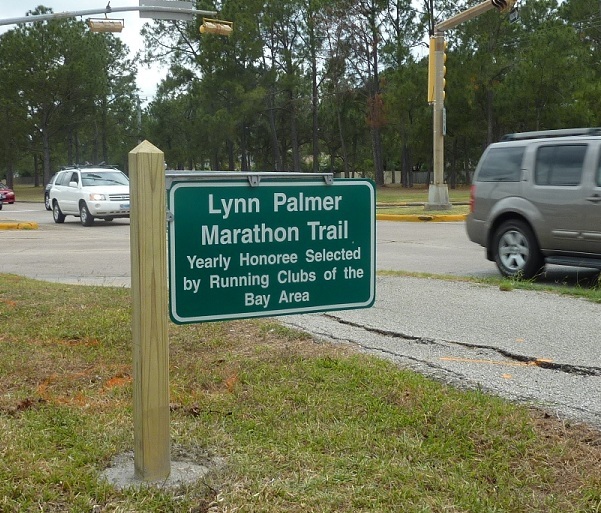 Finally 21 months later and after one political administration change, the Harris County Parks Department put in two signs so that the three major running clubs in the Clear Lake Bay Area could recognize ordinary (not famous) runners. The idea is to rotate an honoree every year from one club to the next. The first honoree is Lynn Palmer. 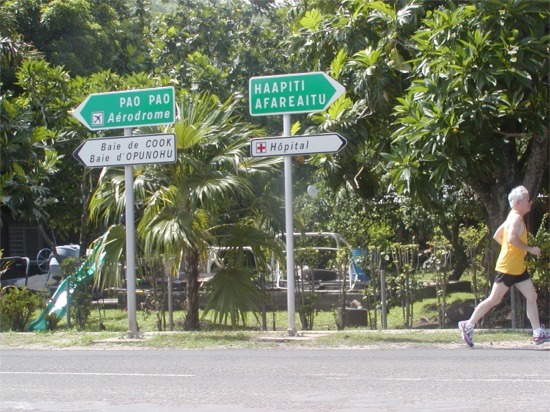 The green and white signs are two sided and are clearly visible to runners going in both directions. 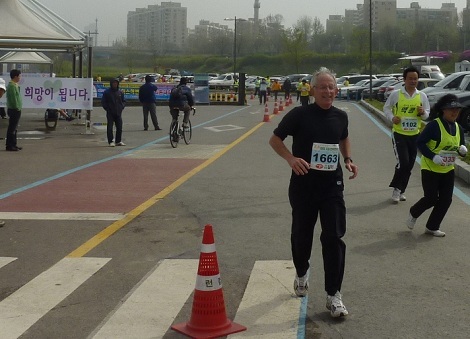 Finishing up the Cancer Kids 10k in Jamwon, Korea along the Hangang River Park. Temperature was 55 degrees. (Left) My time was 54m 17s which was slowed by the clog of runners for the first 2 or 3 minutes. It was literally impossible to get out of the crowd due to the volume of people, enthusiasm and narrow running corridor. It had quit raining about 5 hours earlier and the venue next to the river park was covered in mud. 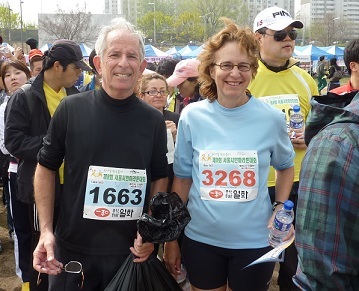 Thanks to the Seoul Flyers running club we were able to participate in this fun event for a good cause. (Right) Lynn and I standing in line after the race. 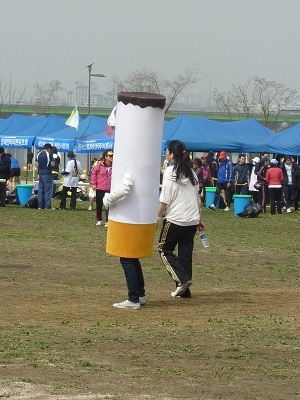 Believe it or not I spotted runners smoking after the race. 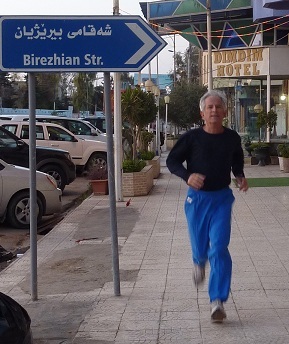 Running on the streets of Erbil, Iraq proved to be relatively easy as long as it was done before sunrise on a holiday when throngs of cars are not clogging the city streets. 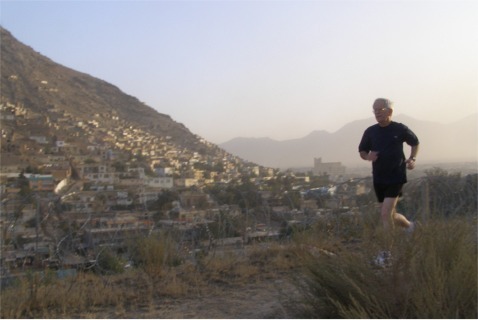 The city itself is not easy to run in due to traffic and lack of planned running areas. After the Little Rock Half Marathon atop the Peabody Hotel in front of the enclosure of the famous Peabody ducks. At this race I came in 5 out of 53 in my age group and 504 out of 2921 participants. Finish time was 1h 55m 33s. Tucson, Arizona.The route was advertised to be mostly flat and downhill. Elevation change was from 3900ft to 2750ft and it was this altitude difference from my normal running elevation of 18 ft that caused me a bit of breathing difficulty. Overall the course was good but the sky was clear and the temperature started in the 40s and ended in the high 60s. I came in 416 out of 1596 total, 262 out of 612 men, 12 of 41 in my age class. Total run time was 1h53m55s at a pace of 8m 42s per mile. Athens, Greece after the race. 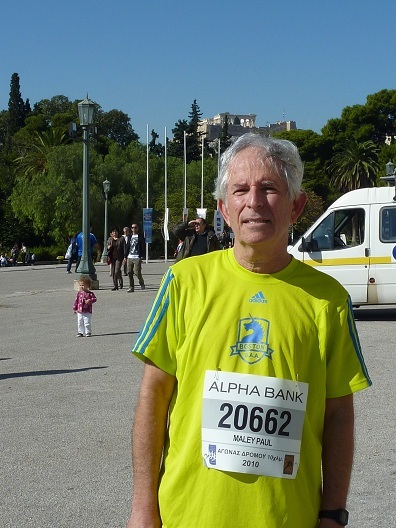 Note the Acropolis in the background.A rather challenging course with lots of runners through the city proper. I ran the 10k in 51 minutes 33 seconds under perfect conditions. 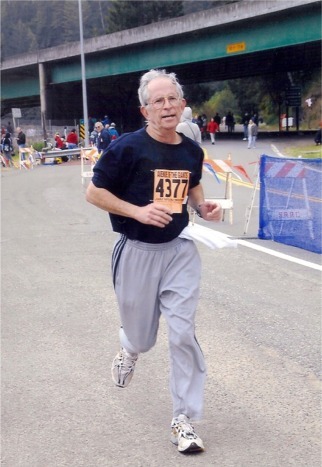 In my age group (60-64); I was 14/67, for men 454/2235, overall 508/3251. At the University of Southern Maine just after the half marathon.I ran this in 1h59m45s which was slower than I expected. 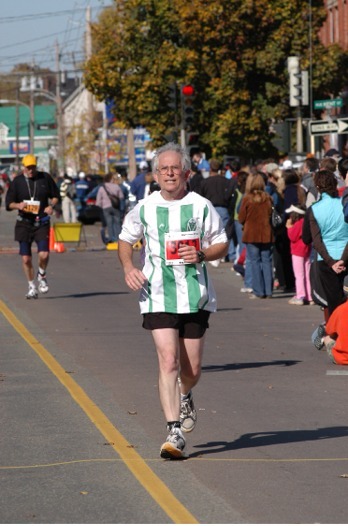 In my age group I was 16/34, for men 495/769, overall 898/2036; pace of 9m 09s per mile. 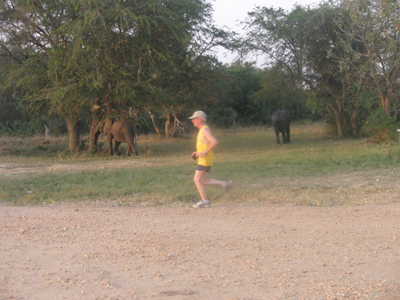 Running a 5K in Murchison Falls National Park, Uganda amongst elephants.I coordinated this 5k run as part of a solar eclipse expedition to Uganda, Rwanda and the Democratic Republic of Congo. It was the 6th ‘Eclipse 5k” run that we have assembled. 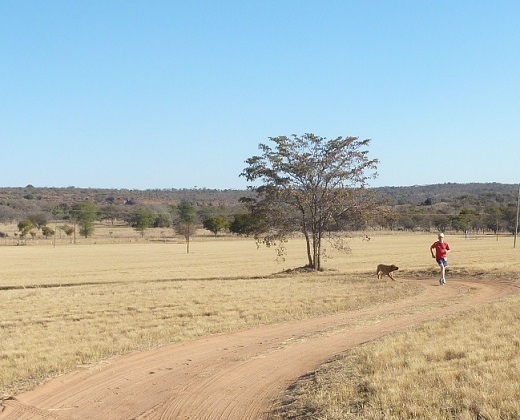 The opportunity to run in a game park-like setting could not be passed up. Along the route we passed bushbuck and warthogs in addition to the baboons and elephants in these images. Clearly there was a bit of danger due to the presence of wild animals close to sunset and no method of defense except to try to outrun them if challenged. Photo in our hotel room after the race. The hosting organization would not let us keep our bibs and there was no way to get photos at this race as they had no official photographers.Temperatures were in the low 40’s with wind chill below that, but overall great running conditions. I set a PR with a completion time of 1h 53m 03s, and came in 1203 out of 6000. Air pollution was low but we had to steer clear of cars who shared traffic lanes. Hundreds of police were deployed which helped keep everyone safe. Traffic was stopped at all levels but local drivers kept their engines running forcing runners to breathe in exhaust (due to the cold). San Christobal, Galapagos Islands.We landed on San Christobal Island late in the afternoon. 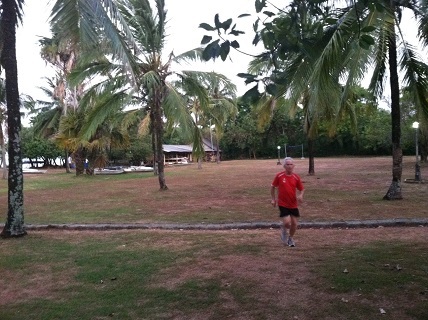 I got a chance to do a 4 mile run barefoot along the nice white sand beach with the opportunity to jump over sea lions. 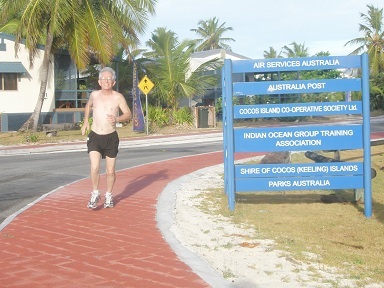 While in the Cocos (Keeling) Islands, about 2750km west of Perth, Australia, I was able to train there in the hot sun and wonderful beach, being very careful not to step on the hundreds of red crabs that tend to cross the road in the early morning and evening when the temperature is best. 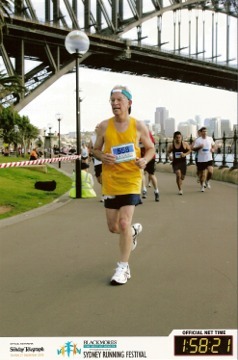 Ascending the road toward the Sydney Harbour bridge, Sydney Blackmores Running Festival on September 23, 2008. Perfect running conditions with temperatures in the low 60’s F. I completed the half marathon in 1h 58m 21s. There were 25,000 runners at the Sydney Blackmore’s Running Festival this year and the field made a slow start up the hill toward the Sydney Harbour Bridge. 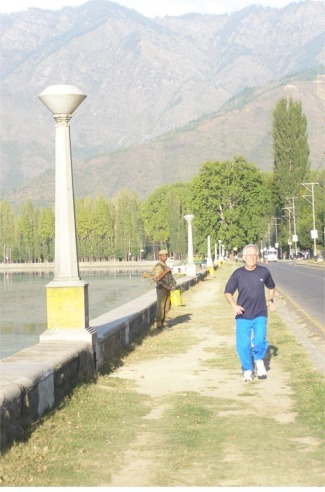 However, the roads were cleared and easy for running. The field separated out fairly well and there was little risk of runner collisions or really bad places along the route. Refreshments were at regular intervals and although the expo was disappointing the overall organization of the race was executed very well. The only problem I had (non race related) was that my one checked bag on Qantas took 5 days to arrive. 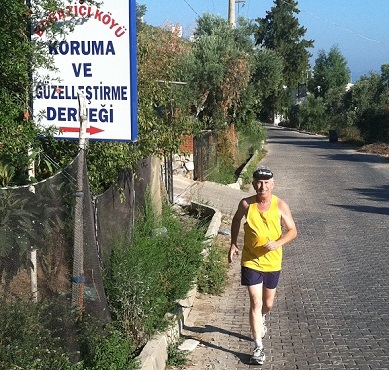 My 36-minute run started and ended at the Holiday Inn, Sarajevo, Bosnia and Hercegovina on June 6, 2008.Bosnia is an out of the way place to run, but even here there are running highlights. A Bosnian Serb marathon runner covered more than 900km in less than nine days in March 2008 to take part in a protest against Kosovo’s declaration of independence. 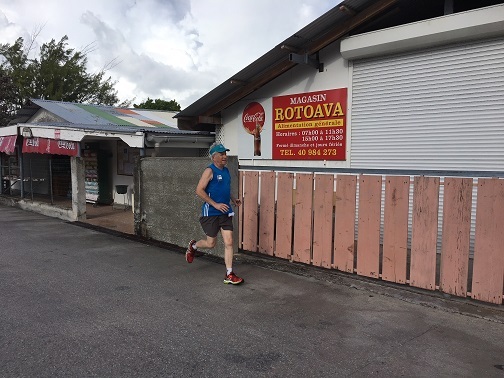 The marathon runner left the Bosnian Serb town of Banja Luka on March 14 and said he had passed through 17 towns before reaching Kosovo, which broke away from Serbia last month. Most Serbs, who consider Kosovo a cradle of their history and culture, are fiercely opposed to the unilateral declaration of independence made on February 17 by the majority ethnic Albanian government in Pristina.More than 30 countries, including the US and most European Union states, have recognised the move, but others including Serbia’s main ally Russia have strongly opposed it.Bosnia was divided into Serb and Muslim-Croat entities after the former Yugoslav republic’s 1992-1995 war. Crossing the finish near Weott, CA May 5, 2008. Weather was chilly and cloudy. The course for the Avenue of the Giants half marathon was mostly flat. I completed the half marathon in 1 hour 57 minutes 56 seconds. Santiago, Chile April 6, 2008. Note the word META on the background sign indicates “Finish”. I completed the half marathon in 2 hours 02 minutes 00 seconds. This half marathon began with temperatures around 59 degrees but rapidly escalated to the high 70’s Fahrenheit but the end. Though the course was quite flat, there were cobblestones and pot holes to circumvent. Traffic was kept at bay and the pre-race expo was well organized. Runners received a great tech shirt. However, there were some noticeable areas that caused issues for runners. Water stops were located each 5km. For half marathoners there was plenty of Gatorade, but no water. For marathoners especially those running slower, Gatorade disappeared from most locations and runners had to buy water from local stores where they could find them. Homeowners watering their yards were cooperative in giving some runners a drink from garden hoses. At one water station there was a fist fight over the little Gatorade there was. At the finish line, workers were dismantled guard rails even before the race ended. Once you finished there was no problem getting Gatorade but water was nonexistent. Bananas and oranges were expected but for late comers (marathoners) they were long gone. For half marathoners there was no sign of fruit at all even 2 hours after the start. After the race ended there was no information available for individual running times. 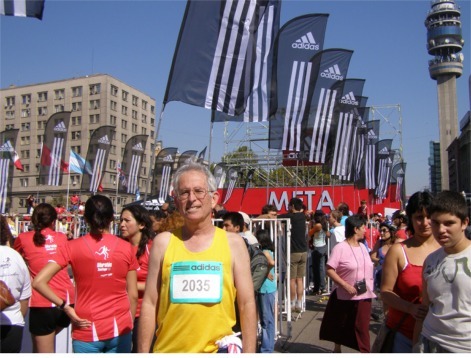 Before the race where 12000 runners participated in the marathon, half marathon and 10k. Changing of the guard at the presidential palace occurs at the race start/finish line the day before the race. 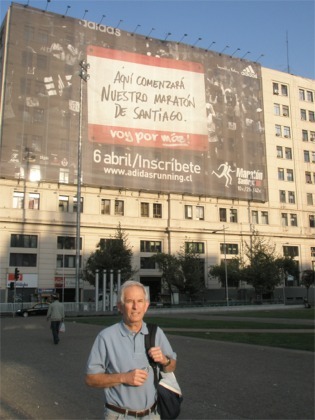 Definitely worth seeing!Santiago is a nice place to run, but the Santiago Marathon/Half Marathon needs some major logistical improvements for the future. Also, starting one hour after sunrise is a bad idea when a sunrise start offers enough light for runners to see and cooler temperatures. Traffic control was good but according to the news that afternoon motorists were angered as they were held up for hours at many streets in the middle of the capital. Varadero, Cuba (Hotel Melia Las Americas golf course) March 15, 2008.Running at a resort in Cuba was not like running other places. But along the golf paths it was fairly safe. Outside the resort there were no sidewalks or shoulders to run on and plenty of places to trip. Valleta, Malta pier, November 2007. Under guard all along the running route. I was not terribly worried until I was on my way back from a morning run and saw the guys with the land mine detectors starting to sweep the running path in the direction I had just finished running! Uncertain times in a dangerous location. Note the barbed wire in the foreground. A military bus was blown up the same morning 2km from my running location at the Intercontinental Hotel. There were 30 fatalities. Sanya, Hainan Island, August 14, 2007. 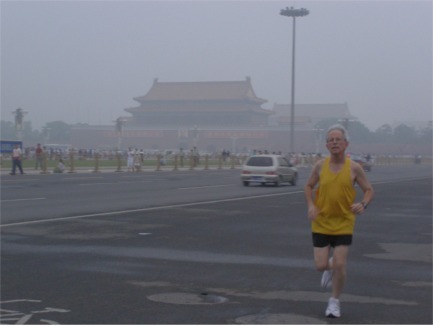 Running at Tien-an-men Square, Beijing, China, August 12, 2007. The air hangs heavy in the summertime and one has to be careful to avoid breathing on heavily smoggy day. 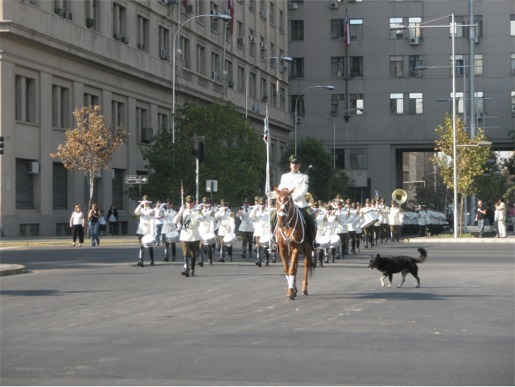 This was taken just after the daily sunrise flag raising ceremony which take place every morning in the Square. Thousands of Chinese onlookers were starting to leave as we began our run along the street and in the Square itself. 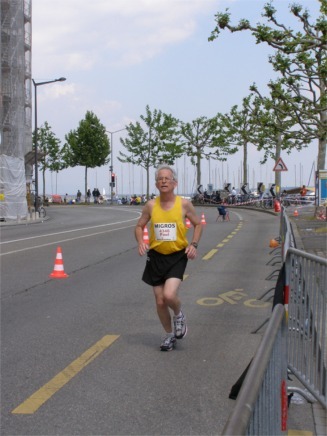 (1) after the race; (2) during the race along the Rue de Mont Blanc.Only 2 months after my 3rd Half (age 59 still), on May 6, 2007 I ran the Geneva half marathon. On race day morning, the skies miraculously cleared after heavy rain the previous day and also night. The race started at 10am and by the time I finished the temperature was 67. It was definitely not the most comfortable weather; I placed 35 out of 69 in my age category and my time was 2 hours 00 minutes 15 seconds. 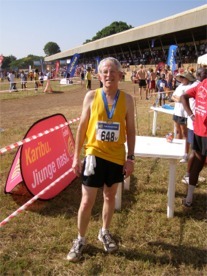 My 3rd half marathon was the Kilimanjaro Half Marathon at age 59 in Moshi, Tanzania on March 4, 2007. This was the hardest one so far due to the first 6 miles increasing from 5000ft to 6000ft altitude and then the reverse going back. In addition the temperature was in the low 80s Fahreheit. I came in 258 out of 507 male runners overall in a time of 2h 10m. 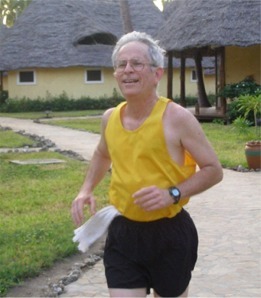 The elite Kenyans and Tanzanian runners passed me and completed the half in 50% or less of my run time as usual. Mt. Kilimanjaro at 19,340 ft was visible constantly during the first part of the run. At the race venue, Mt. 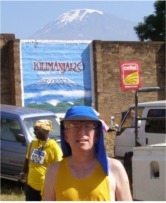 Kilimanjaro is in the background. 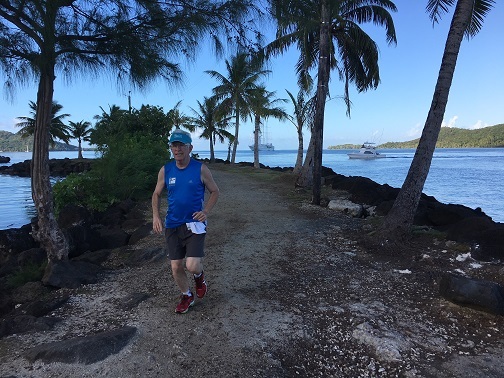 Following the Kilimanjaro half marathon, we traveled to Zanzibar where I recuperated on the beach and ran on the grounds of the Ocean Paradise Hotel at Pwani Mchangani. San Antonio, Texas December 14, 2006. 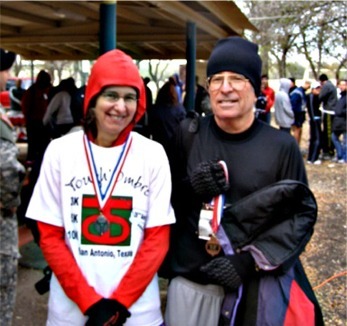 Lynn and I both won medals in our age classes at the Tough Hombre 10k race. Chong Li, Taiwan September 2, 2006. 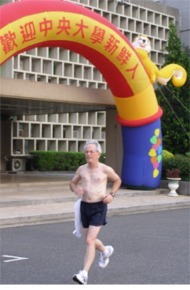 On campus at National Central University near Taipei, it was just as hot and more humid here than in Houston. Kourou, French Guiana September 21, 2006. 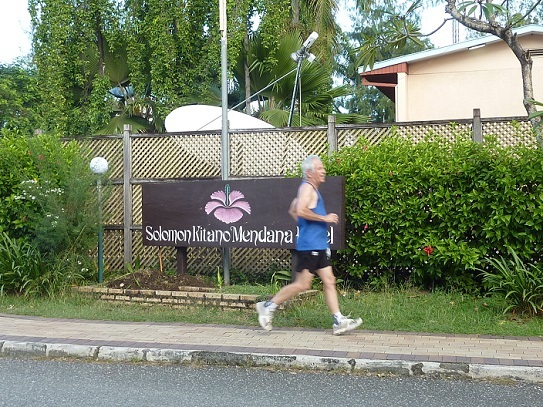 Near the Mercure Atlantis Hotel in Kourou, French Guiana the day before the annular solar eclipse. 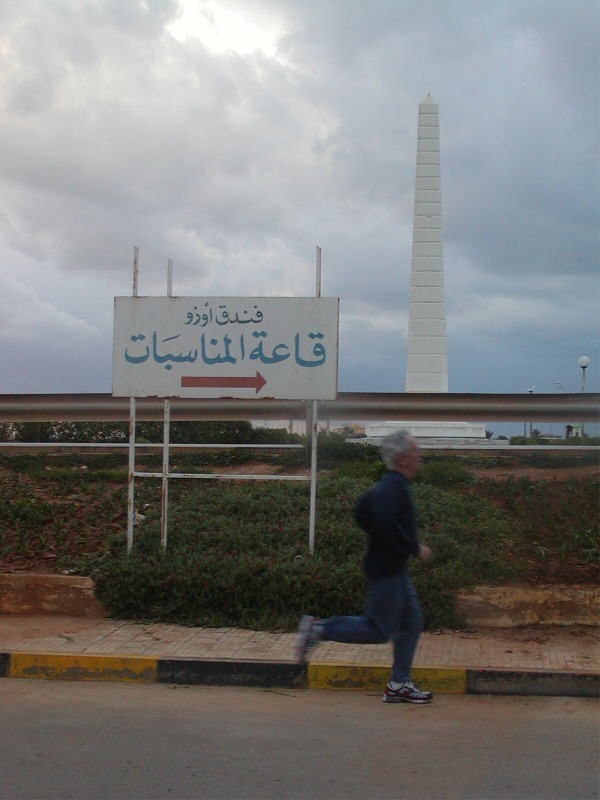 Benghazi, Libya on March 30, 2006. This is the 2nd international “Eclipse 5k run/walk” co-coordinated by Lynn and me and took place following the total solar eclipse on March 29. We mapped the course using GPS along the Lake of July 24. Hotel Uzo is in the background. 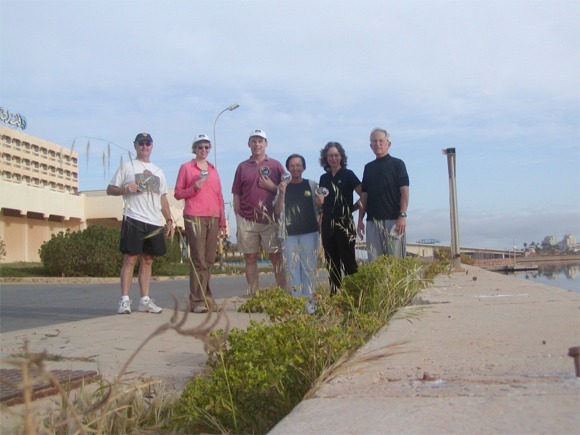 It was also our second trip to Libya. Mabul Island, Sabah, Borneo on February 22, 2006. 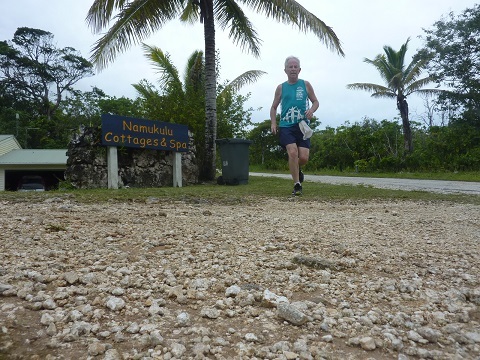 When you are on a tiny island, you have to find whatever is available as running surface. 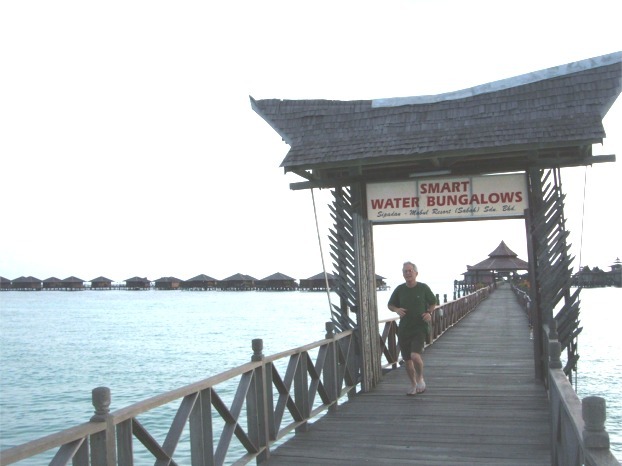 In this case, I had to run on wood planks which connected overwater hotel rooms with the island. San Andres Island, Colombia in front of the Hotel Aquarium November 24, 2005. Temperature is 80 degrees most of the time. The photo was taken in a rare moment when I was not dodging the ever present motorcycles and potholes. Pyongyang, North Korea October 17, 2005. 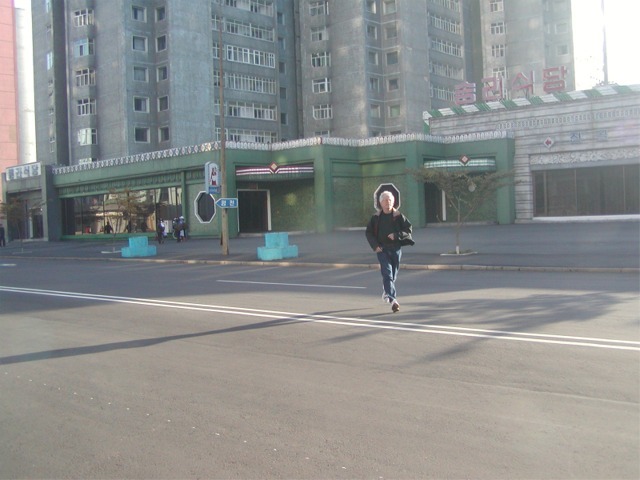 In downtown Pyongyang I had no fear of being hit by a car since there aren’t any. Abu Dhabi, United Arab Emirates, May 22, 2005. I wanted to run somewhere special around my birthday. Well, Abu Dhabi is definitely not the usual place. It was over 100 degrees in the evening hours, but it was a dry heat. Besides, running away from a bakery is always preferred. 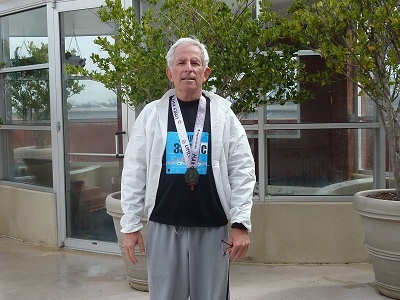 My 1st half marathon at age 58. Vancouver BC, Canada May 1, 2005 and placed 1866 out of 6590. I am the one with number 6135. My time was 1 hour 57 minutes. The previous day it poured torrentially and it seemed likely to continue through race day; however, the rain did move out and we were very lucky. It always pays to follow directional arrows especially when you cannot read the signs. Running in the direction of a hospital is always a good thing, just in case. 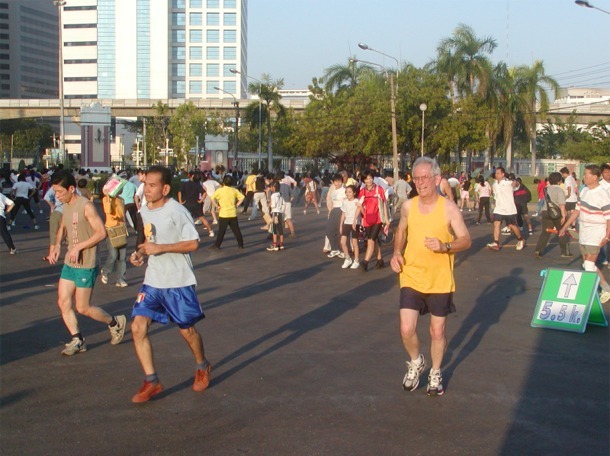 Lumpini Park is a great place to run provided you get there when hundreds of others are not running. On weekends it is tremendously crowded but still offers a good track. Isle of Man, May 2004. Man, it was so cold here you needed all the warmth you could get. Due to narrowness of the sidewalks and high traffic in the streets, it was necessary to stretch in whatever spot you could find. This was a cold weather forest run and required heavy clothes. Also, a heavy sulphur smell was in the air making it hard to breathe. While I do not have a photo of a very scary running incident, on August 21, 2007 I had finished running just 5 loops inside the underground parking garage at the Steamboat Grand Hotel in Steamboat Springs, CO when I ran directly into a black bear the size of a Honda. It was 5.09 am and the temperature as 50 degrees just before sunrise. Luckily we were both as startled by one another but as I came around the corner I stopped a mere 5 feet from him. I took off quickly the same way I came and tried to enter the hotel through one of doors in the parking garage. Unfortunately I was not staying at this hotel and had ducked into the garage because it cold outside and much warmer inside. Each access door into the hotel itself required a hotel key. 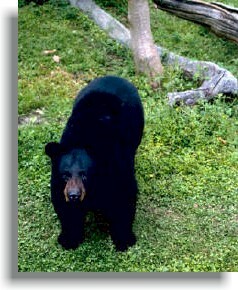 Therefore I had to really run quickly out another garage exit not far from where the bear first entered. It was a dangerous and close encounter that I was lucky to survive. The most important lesson I have learned is to run safely so as not to become injured or to cause injury to others. So it was surprising as a novice runner to have found some irritating and unsafe aspects of participating in large races. 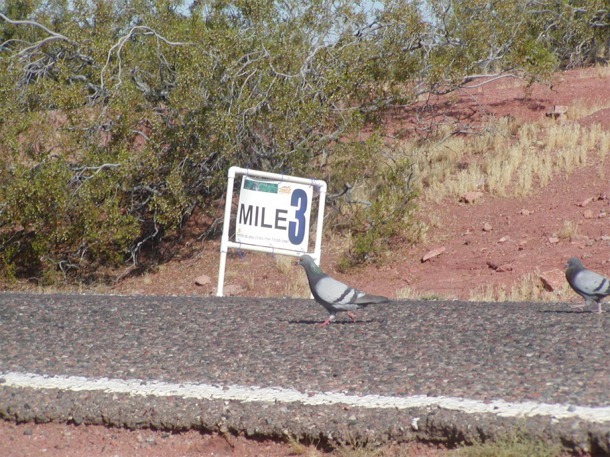 In particular, many runners have a certain lack of awareness. When in a herd I find groups of runners blocking the way preventing others from passing safely. Walkers are notorious for this. Why do they walk abreast forcing runners to go around them? 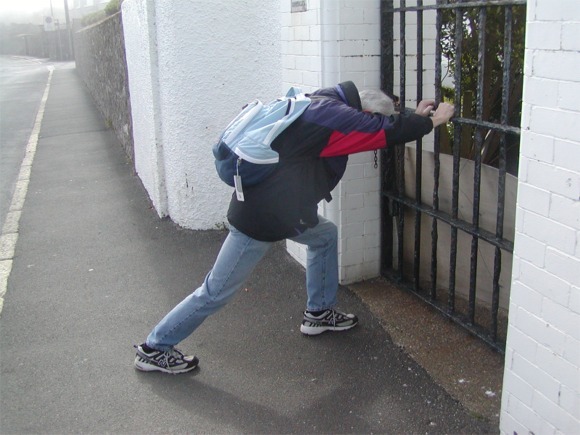 In addition, some runners bump into others either because of lack of coordination, being inconsiderate or perhaps due to being tired. Still others move in and out of lanes causing a threat of collision to runners moving at a different pace. On streets as a spectator I have had runners holding American flags nearly stab me with them as they strode down the sidelines (NY Marathon November 2005). Other runners will straddle the curb and even run up on the curb. 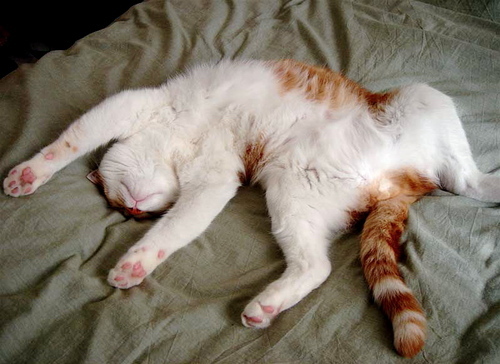 Stretching is very important and should be done at the proper time no matter what. 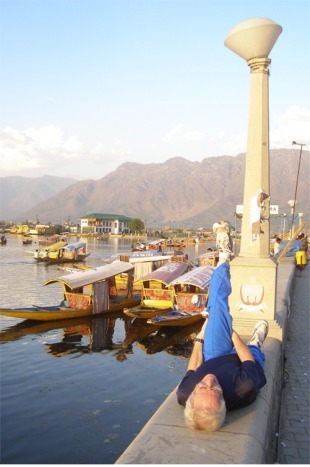 Stretching along Dal Lake, Srinagar, Kashmir. When the temperature is too hot, finding a lawn sprinkler or other source of water can be vital. 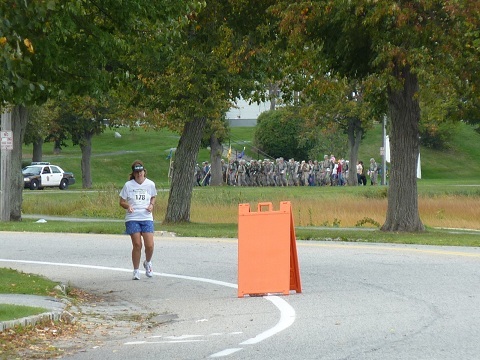 Here is a 10 mile race where there was actually a person assigned to hose down the runners. Runners at the Lunar Rendezvous Run in Houston on July 19, 2008 after the race. I know running is hard but wait, this was only a 5k run! 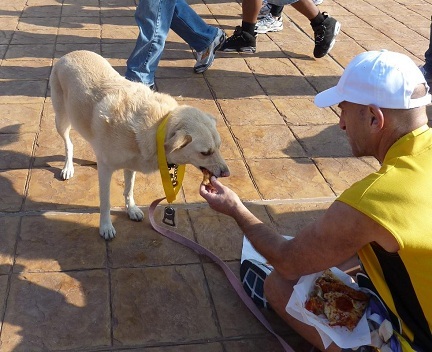 This dog shown eating pizza completed a half marathon (Laporte Bridge Run 12/5/10). Another challenge is running in races where there are huge masses of runners. 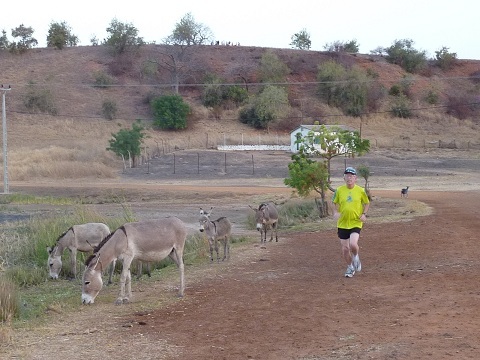 The herd moves slowly at first and valuable seconds are wasted at the start line if you are not in front. Of course, being in front means slowing down the faster runners, so there is merit in putting the faster runners in the lead and progressively slower ones at the back. One advantage is to simply wait til the masses have left the starting line. If using a chip, it almost doesn’t matter when you start since your chip is activated when crosses the mat at both start and finish. Just wait a while for the herd to depart the start line and thin out. Then you can begin. The best way around this is to run in smaller races which is a lot more fun anyway. Just some thoughts from a novice runner. In Phoenix, Arizona I was at mile 3 waiting for it get cooler. If you wait long enough, you never know what creatures will be watching the race. 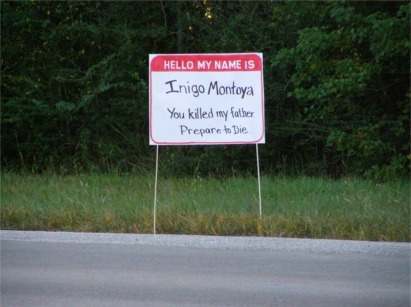 A sign you do not wish to see on the race route. 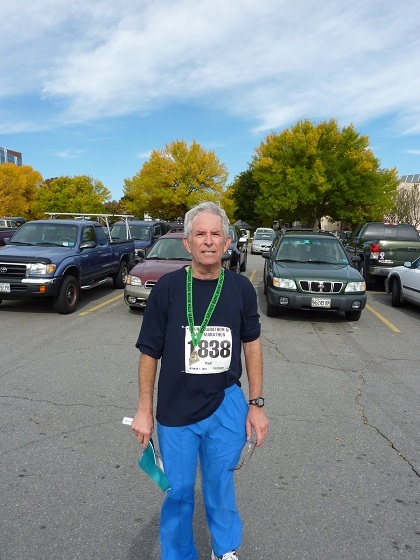 This is from the Lincoln (Nebraska) Marathon May 5, 2015. 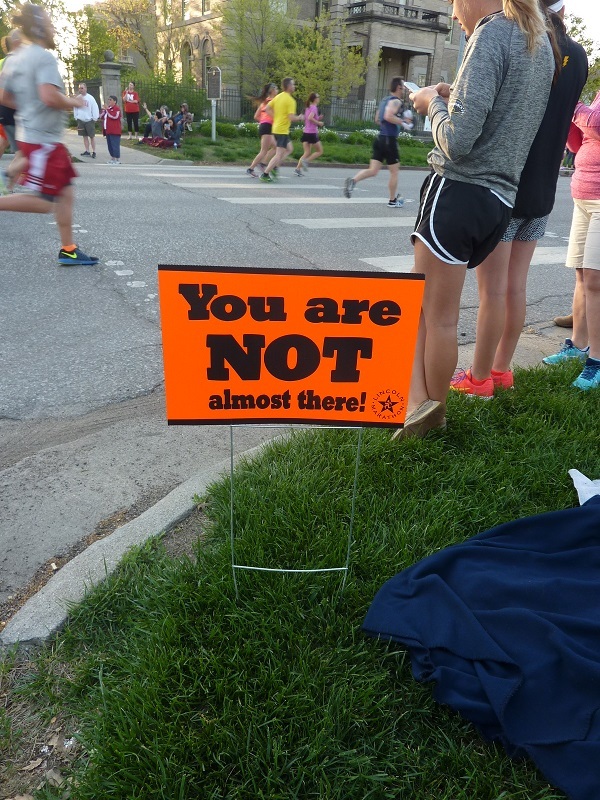 Whoever thought this one up did not realize that runners need positive motivation.